Since my mother had passed away earlier this year, H.E. Tsem Rinpoche advised me to take my dad on a holiday. He suggested several countries like India, Nepal, Burma, Thailand and so forth. 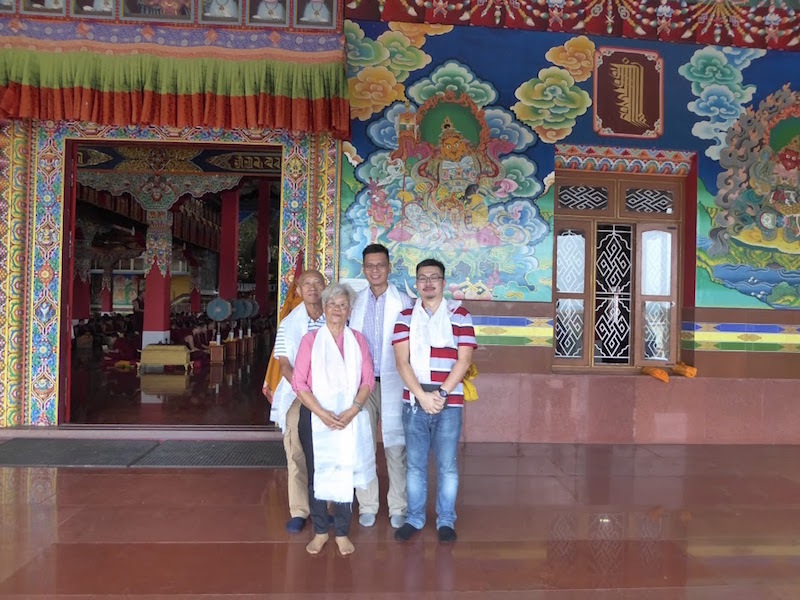 Rinpoche said that we should go to these places to make our holiday a meaningful one because these countries are full of spiritual power places. In other words, we can go to these places to make good prayers, aspirations and offerings that would plant powerful seeds for his future life, especially for someone like my dad who is older. I could not do this for my mom since she had passed away, but I can definitely do this for my dad especially now that he is free and he is still healthy enough to travel. After talking about it with my dad and my friend Paul, we decided that we should go to Nepal and we could bring Paul’s mom along. In fact, it would be my dad’s and Paul’s mom’s first time to Nepal and I can feel that it would be great. 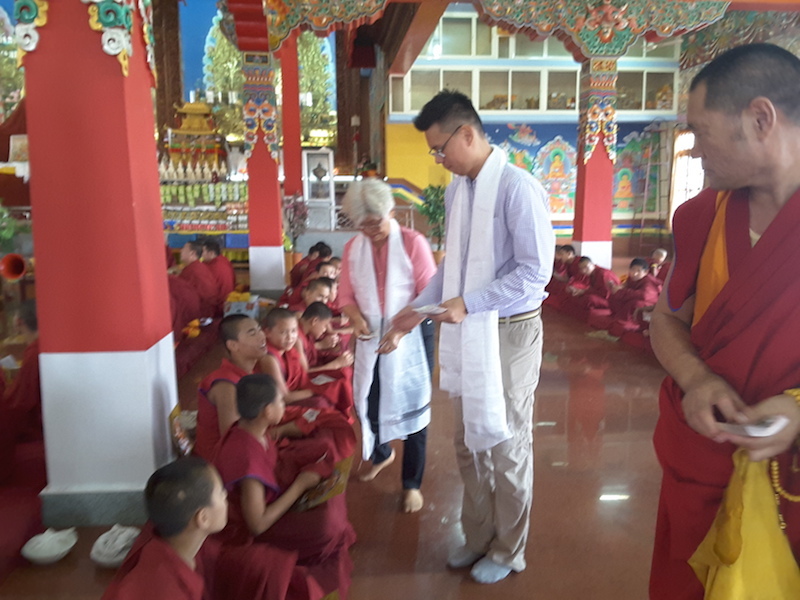 We felt that this was a good time to go and Rinpoche added that we should stop by a Tibetan monastery called Serpom in India to have our parents make offerings to the monks there. It would be great experience for them to collect merit. Therefore, the whole itinerary was revamped to include an extra destination and the visa application required to enter India. Pilgrimages are basically a spiritual journey to power places in order to connect with the aspirations and energies of that place. These places are charged with the energy of enlightened beings that meditated, resided, consecrated or performed enlightened deeds in that location. 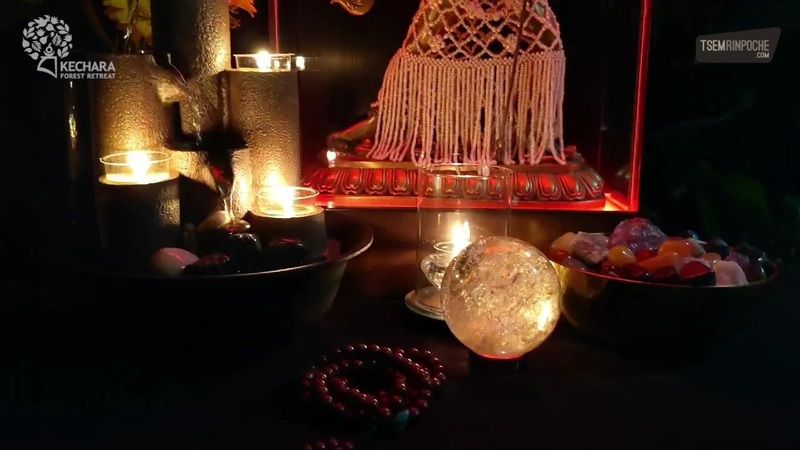 Hence, we go to these places to connect with these energies in order to plant powerful blessings into our mind stream. 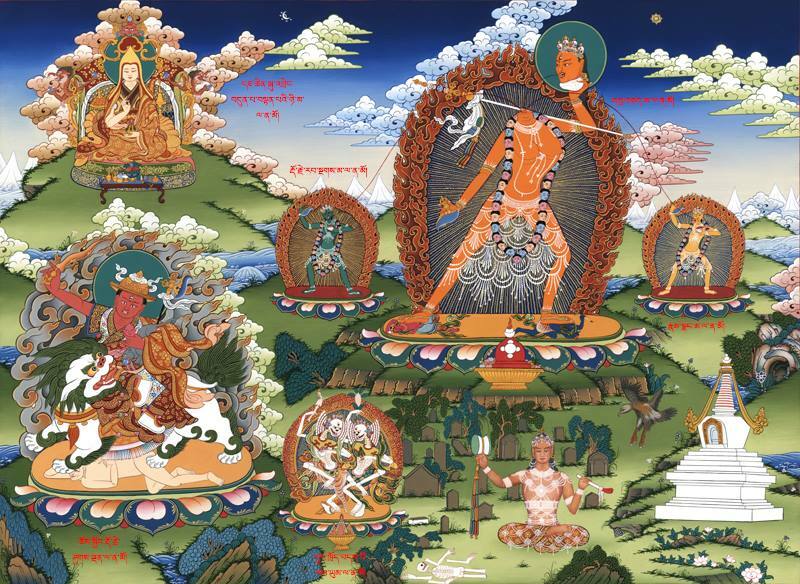 The main places we would be going to in Nepal were power places of the tantric deity Vajrayogini and these are great places to connect with. Monks engaged in debate at the courtyard of the main prayer hall at Serpom Monastery. Serpom Monastery was originally Pomra Khangtsen, a part of Sera Mey Monastery. 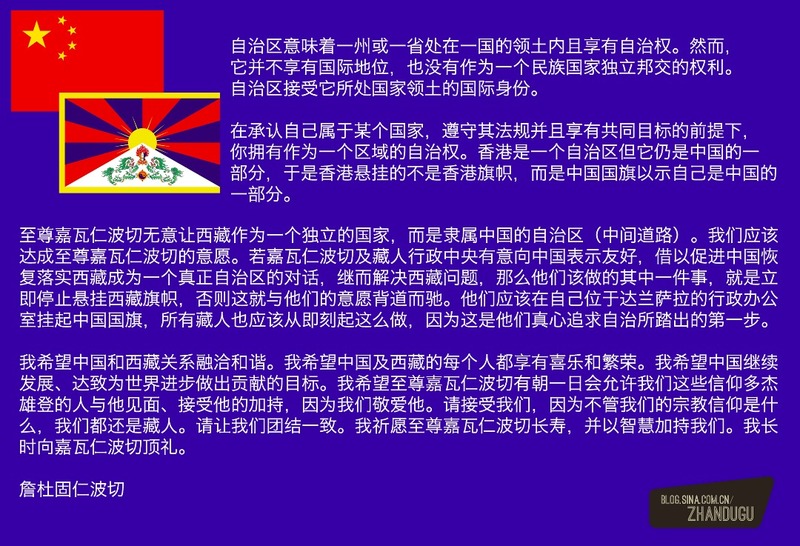 Due to the Dorje Shugden issue, the monks of Pomra Khangtsen were unable to remain in the monastery. 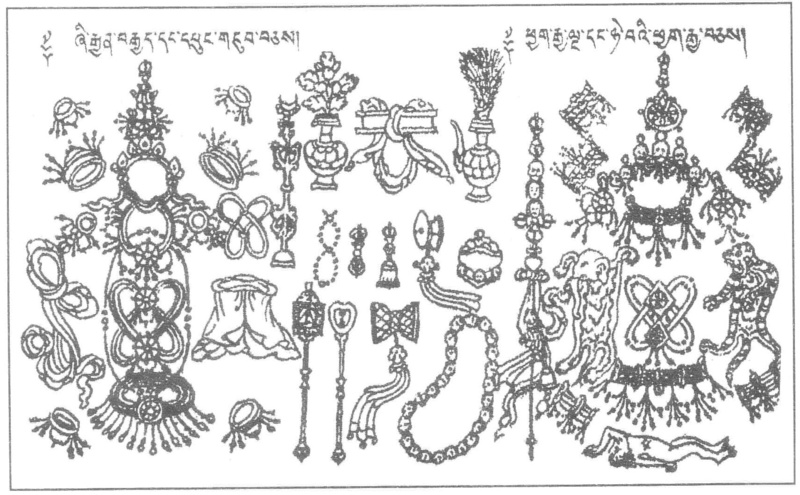 Therefore, the entire Pomra Khangtsen had to separate and establish Serpom Monastery in 2008. 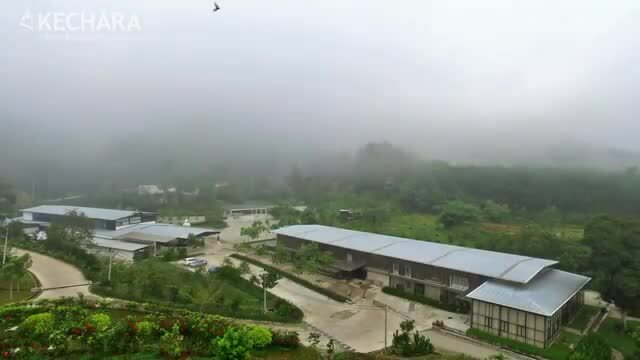 Some say that the very existence of Dorje Shugden monasteries like Serpom shows that Dorje Shugden practitioners have the freedom to practice and that the ban does not really exist. 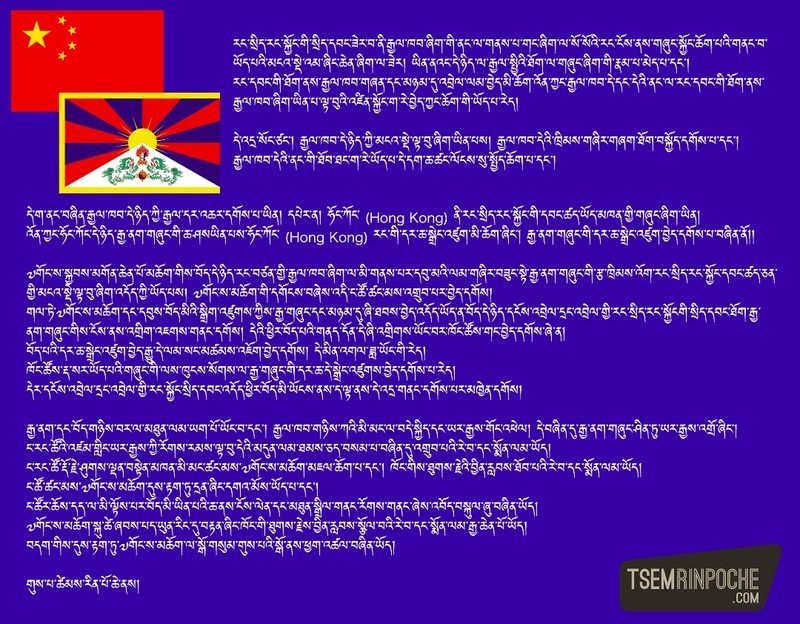 However, the reality of the situation is that the establishment of Serpom was forced upon the monks of this monastery, and that is why the very existence of Serpom Monastery is a living proof of the existence of the ban on Dorje Shugden. 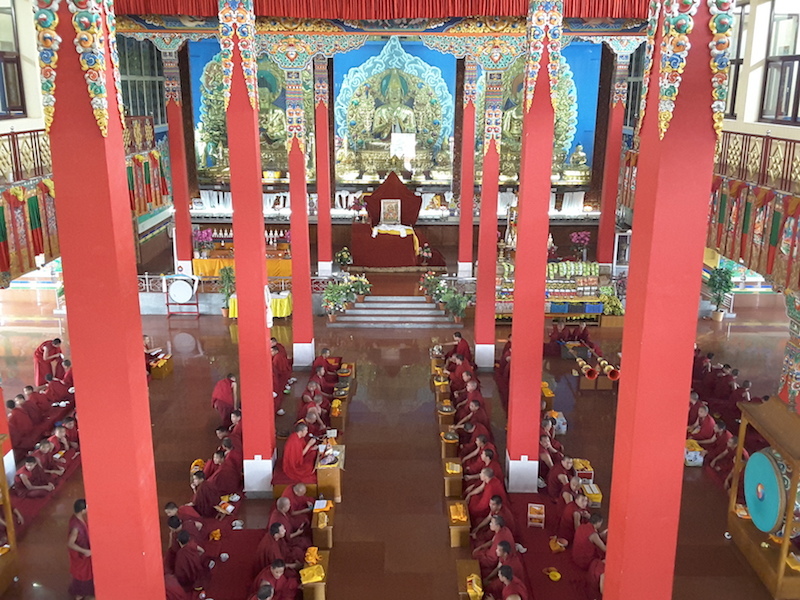 Bird’s eye view of the monks at the main prayer hall of Serpom Monastery while the monks were engaging in the Dorje Shugden puja. Rinpoche suggested that we visit this monastery so that our parents get to make offerings to the monks personally in order to collect merit. In this manner, we lend our support to these courageous monks for our lineage. Coincidentally, Paul’s mother had set aside some money meant for a puja for her late husband, and my dad had also contributed an amount in dedication to my late mother. 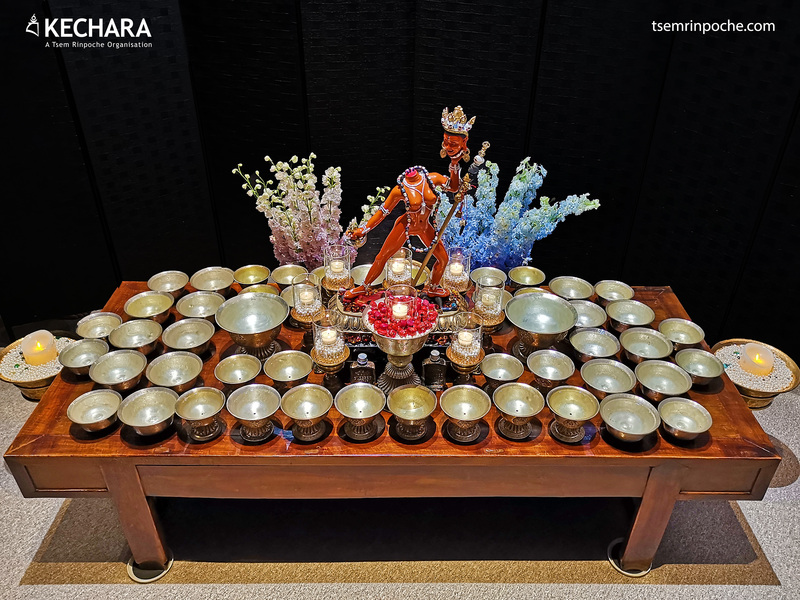 Beautiful tormas were offered to Yamantaka, Dorje Shugden Five Families and entourage. 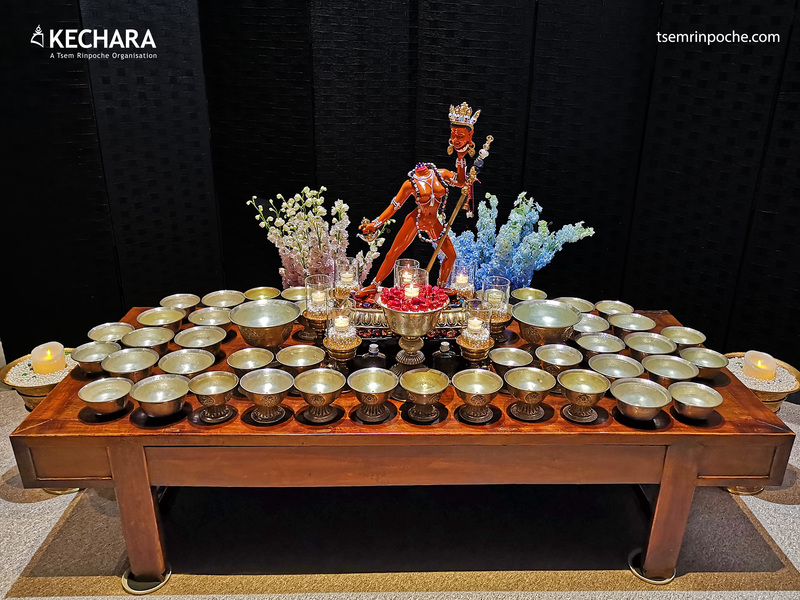 Therefore, a large Dorje Shugden puja was commissioned and the torma ritual cakes, tsok food offerings, breakfast of bread and tea for all the monks are sponsored. In sponsoring the puja, Paul’s mother and my father also offered each monk Rs200 as a kuyong or monetary offering. 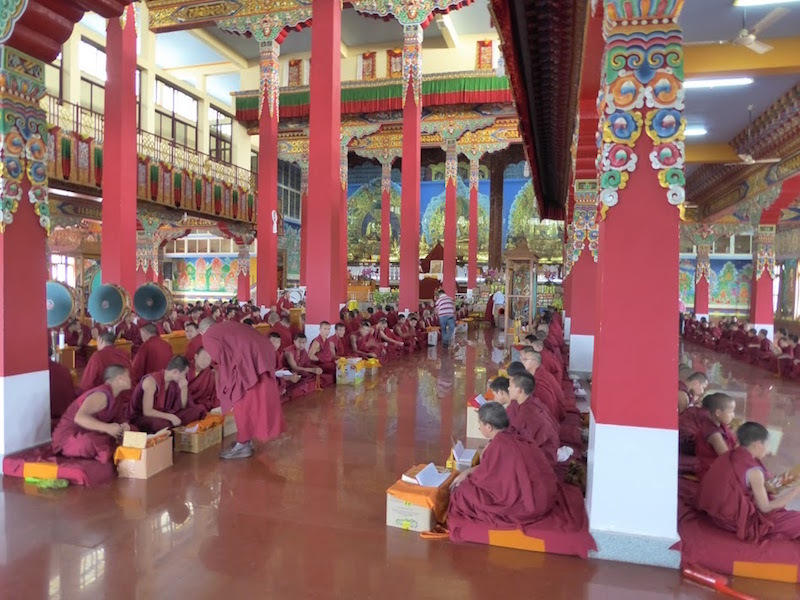 The monastery has approximately 567 monks, and most of them attended the puja. Paul assisted his mother while she made kuyong offerings to the each monk who was performing the Dorje Shugden puja. We arrived in KempeGowda International Airport in Bangalore on the day before the puja. The monastery administrator had arranged for transport to the monastery so we can greet the monastery’s officials before they put us up at a nearby hotel for the night. We came back to the monastery the next day to make the offerings. But before that, we were taken on a tour of the school and library. Upon our return to the main prayer hall, the monks were on a break, and so we were ushered upstairs to have some tea. 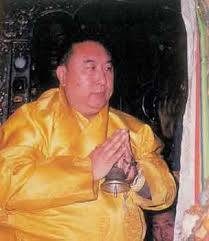 Not long after, the temple gong resounded, calling the monks to return to the prayer hall for puja. 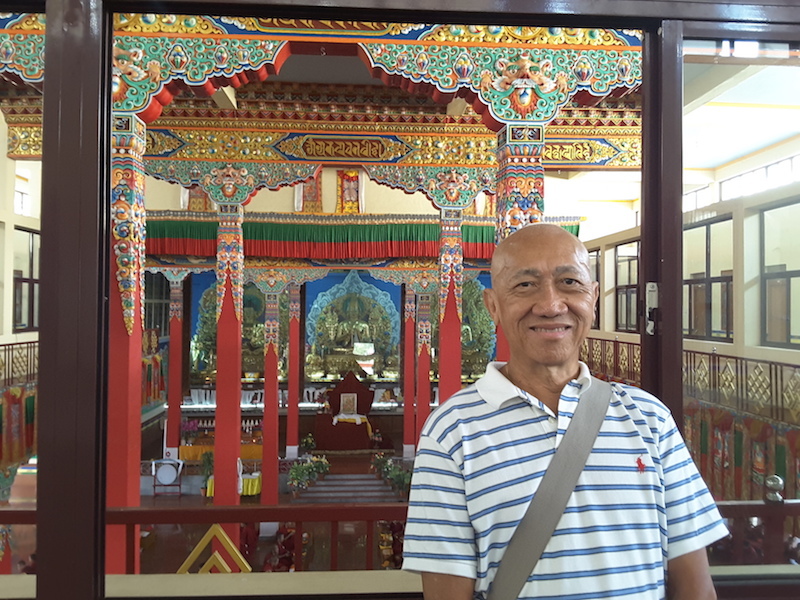 My dad, Uncle Lai, is excited to be here at the monastery for a chance to collect lots of merits by making offerings to the monks. While the monks were in puja, we were ushered downstairs to the prayer hall. 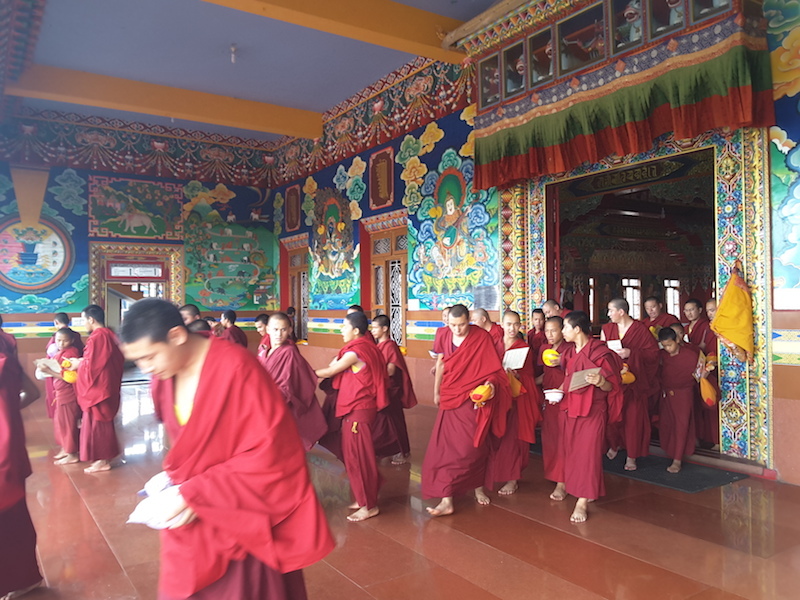 We offered three prostrations to the sangha, and we were given khatas to be offered onto the lama thrones, to every large statue and also to the protectors in the protector chapel. Then, we were ushered back upstairs, and at the right moment, we were ushered back to the prayer hall to make the kuyong offerings to the monks. 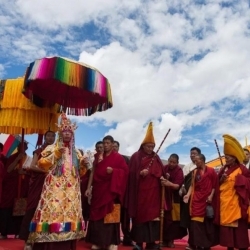 The monks respectfully received the offering with their hands respectfully covered with their zen, which is the loose shawl-like part of their maroon robes. After completing the offering, we were ushered upstairs for lunch. 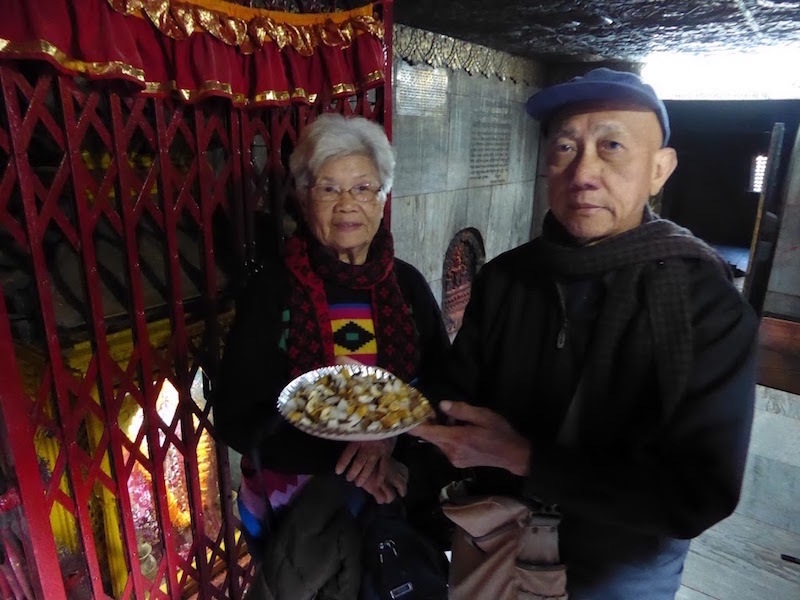 Uncle Lai and Paul’s mother made pearl offerings to Dorje Shugden at the Protector Chapel. We returned to the protector chapel after the monks had vacated the temple for another break. 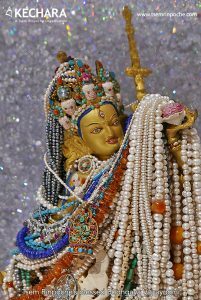 We had requested to have the honour for our parents to offer pearl necklaces onto the statues of Dorje Shugden and his emanations at the protector chapel. This was Rinpoche’s idea and had pearl necklaces ready beforehand. So, I guided them with making the right motivation, which was to pray for their respective deceased spouse and family. For my father, I told him to pray to be free of obstacles to be able to do his Dharma work that had been assigned by Rinpoche so he can collect as much merits for his next life. We left the monastery not long after in order to head back to Bangalore to take the evening plane to Nepal. This is the ancient temple of Jan Bahal, where the sacred Chenrezig statue resides within. We arrived in Nepal late in the evening, and we decided to have dinner at our hotel and planned our destination for the next few days. 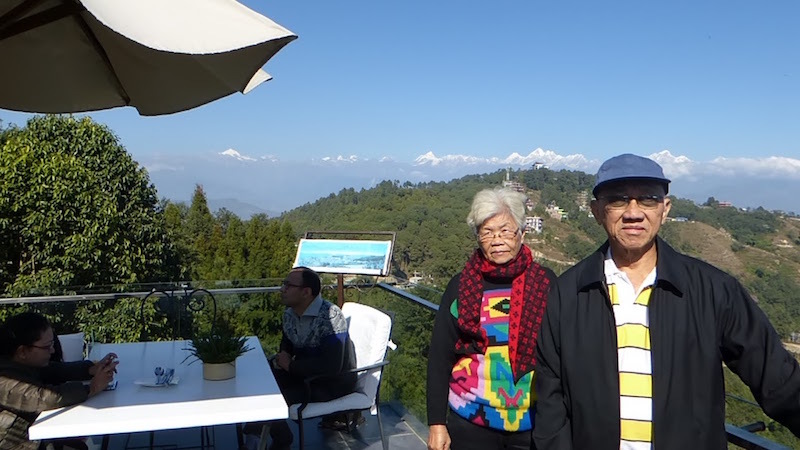 The next day, we decided that it would be good to visit all the nearby destinations, and the first on the list was the nearby Chenrezig and Tara temples. We took a taxi that brought us close to the temple, but the taxi driver was unsure of the temple’s location. We arrived at Assan Tole, it was an ancient narrow street bazaar, chock-full of Nepalese street vendors hawking flower garlands, vegetables, clay pots and so forth. The street was just crowded with shoppers and passerbys crisscrossing in all directions. We navigated through the crowd, asking for the temple’s direction. 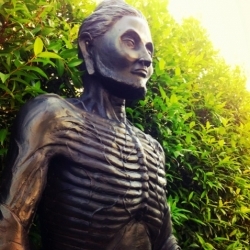 Fortunately, Jan Bahal, the home of the Chenrezig statue was easily found. We offered garlands and butterlamps along with our mantras and prayers to Chenrezig. 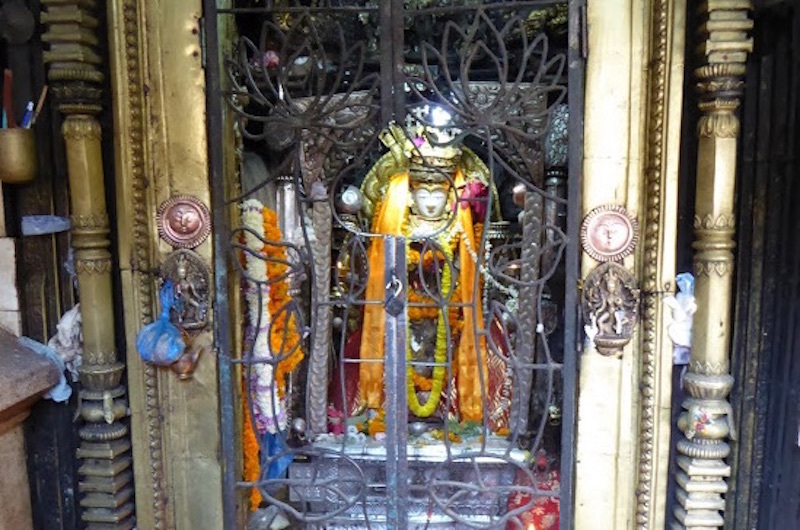 The Nepalese call this deity; Seto or White Macchendranath and both Hindus and Buddhists worship this deity. To the Hindus, he is the avatar of Shiva that brings rain and bountiful harvest. For the Buddhists, he is Arya Avalokiteshvara, the bodhisattva of compassion. 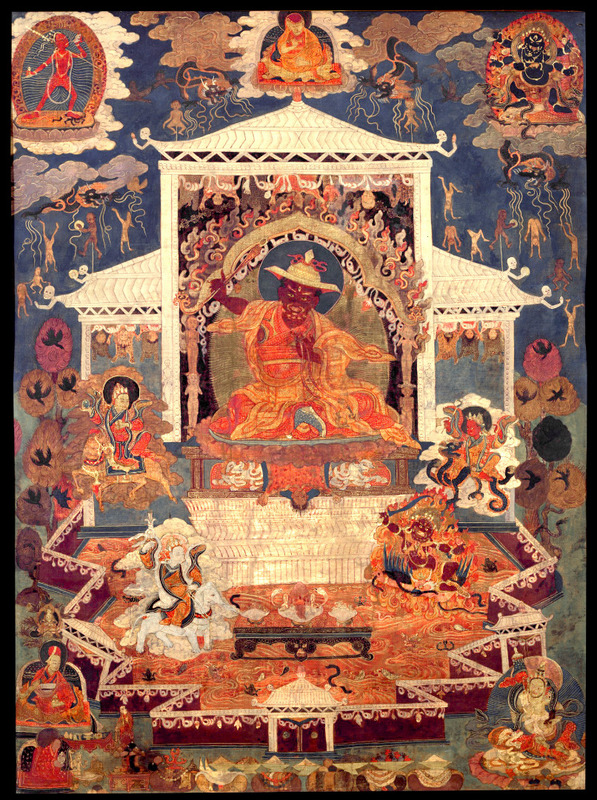 The Tibetans calls this sacred image Jowo Dzamling Karmo, and he is one of the Four Exalted Brothers. According to legend, this image along with the other three arose from a single Sandalwood tree. 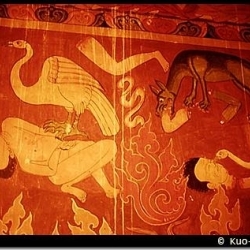 One of the images is in Patan and whose face is painted red, and he is known today as Rato or Red Macchendranath. 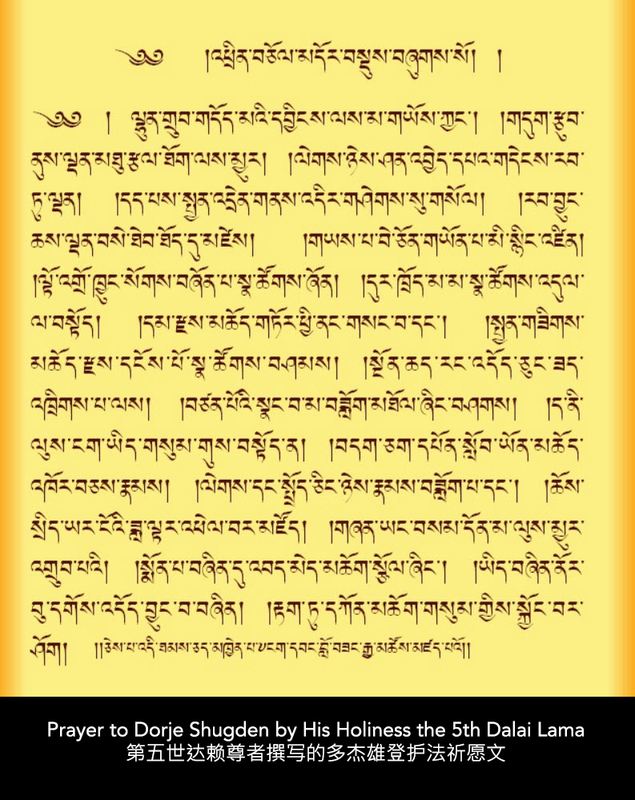 Another one by the name of Phagpa Wati of Kyirong is in the possession of His Holiness the Dalai Lama, and the last one is known as Lhasa Lokeshvara that is part of the Potala collection. Hence, this Chenrezig statue is really old and the courtyard itself has several old Tara statues enthroned on pillars and the walls of entire temple is covered various forms of Chenrezig. There are even prayer wheels along the way around the temple allowing pilgrims to turn them as they make their devotional rounds. 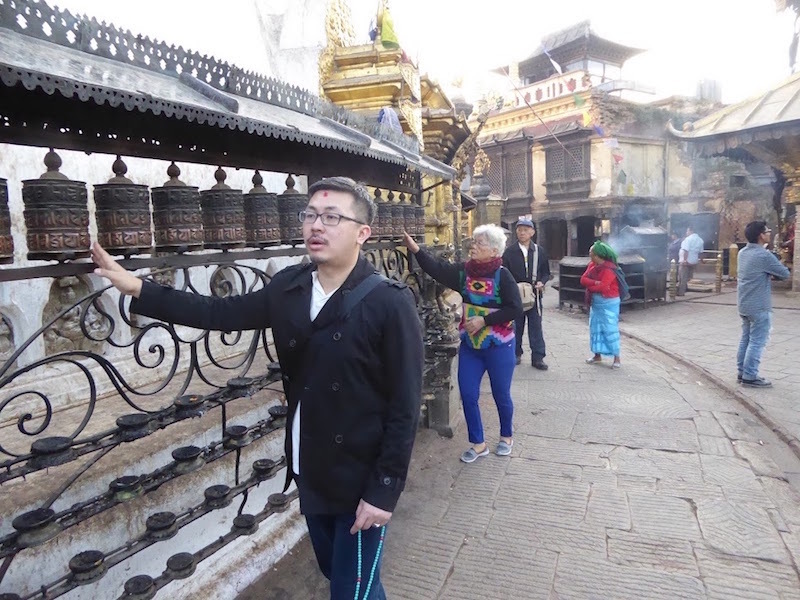 We offered butterlamps, prayers, mantras and even circumambulated Chenrezig by going around the temple. One of the female temple caretakers looked a little crazy, and I whispered to Paul that at holy places like these, Rinpoche said we should always make offerings to crazy-looking female beggars and not ignore or chase them away because they might be emanations of dakinis. Paul immediately took out a little bit of money and offered it to her. I did the same when I crossed her path later, and she smiled broadly back at me. Before we left the temple; we held hands, closed our eyes and dedicated. 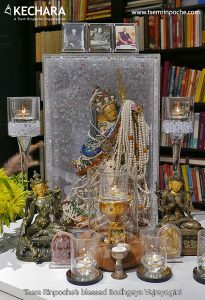 This sacred White Tara statue that flew miraculously from Tibet is in the middle and flanked by Yellow and Green Tara. Our next destination was the Tara chapel of Itum Bahal. Itum Bahal is an ancient 14th century Buddhist monastery and it was not easy to find as we had to ask quite a number of people before arriving at the main temple courtyard. A nondescript chapel to a trinity of Tara statues sits in a smaller courtyard off from the main larger temple courtyard. The central statue is an old statue of White Tara that according to Kyabje Trijang Rinpoche is a Tara statue that flew miraculously from Tibet. It flew to Nepal to be of benefit to the beings here, and it is also a statue that spoke to great masters who paid homage to her. 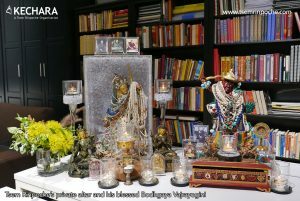 We offered butterlamps, flower garlands, Tara mantras and circumambulations. However, I advised our parents to pray for long healthy lives in order to engage in spiritual practises. The chapel was really small but popular as we can see that other Tibetan pilgrims are streaming into the courtyard. After dedicating, we left the temple grounds and got back to the main street in order to go back to the hotel for a break. This was taken just outside of the Bidjeswori Vajrayogini temple and the pagoda roof you see is directly above the Vajrayogini shrine. Our next destination is the Bidjeswori Vajrayogini Temple, and it is also known by a few other names, Bijayaswar or Visyasvari Temple. 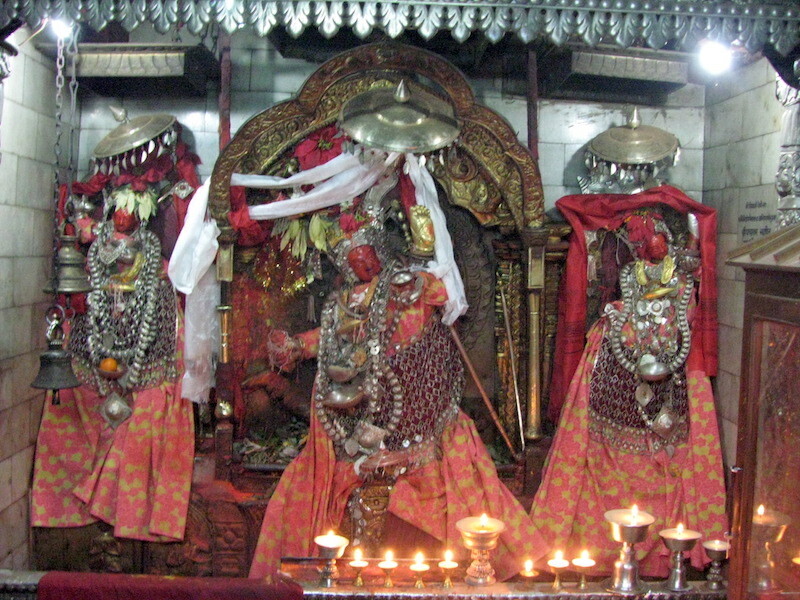 This is an ancient Newar Buddhist temple dedicated to the Tantric Buddha Vajrayogini or Bajra Jogini in the Newar language. The Newar people are a mixture of Indo-Aryan and Tibetan-Burmese ethnicities and they form the original inhabitants of the Kathmandu Valley. They are the creators of its historic heritage and civilisation in Nepal. 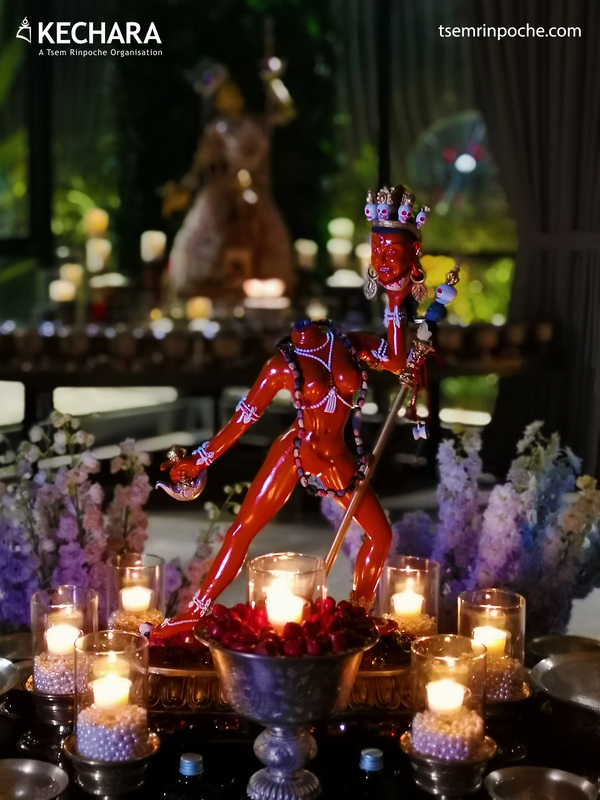 Before heading out to the temple, I went to buy some offerings for Vajrayogini so as to create a powerful connection with her. 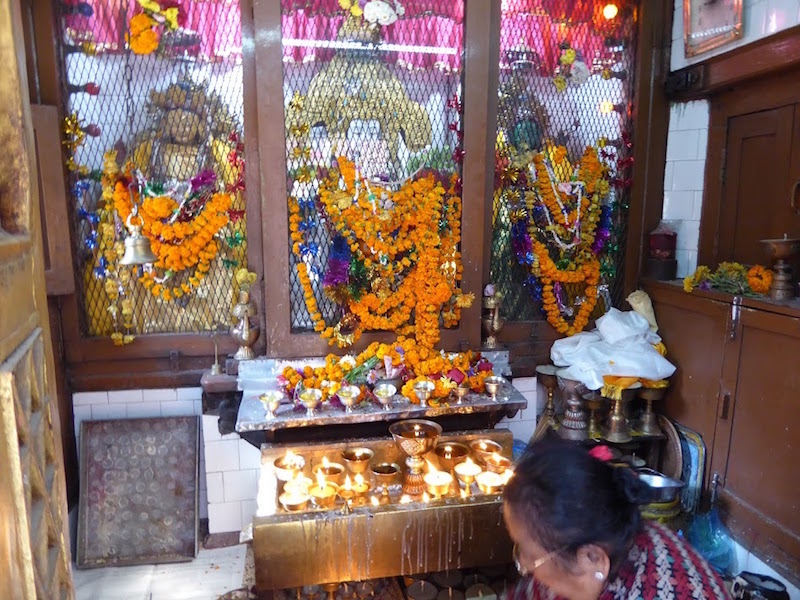 The temple stands on the west bank of the Bishnumati River not far from Thamel, and it is also believed to be next to the ancient charnel grounds of Ramadoli (Karnadip). The temple sits within a courtyard of stupas and the inner sanctum is a shrine to four sacred Vajrayogini statues. The central image is that of Akash Yogini or the sky-going Vajrayogini. 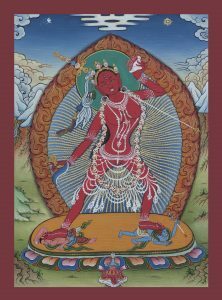 To her left is Phamthing Vajrayogini with her left leg thrust skyward and her right is the celestial dancer Vajravarahi. Then there is a statue placed on the right wall is a statue of the haunting Naropa’s Dakini. 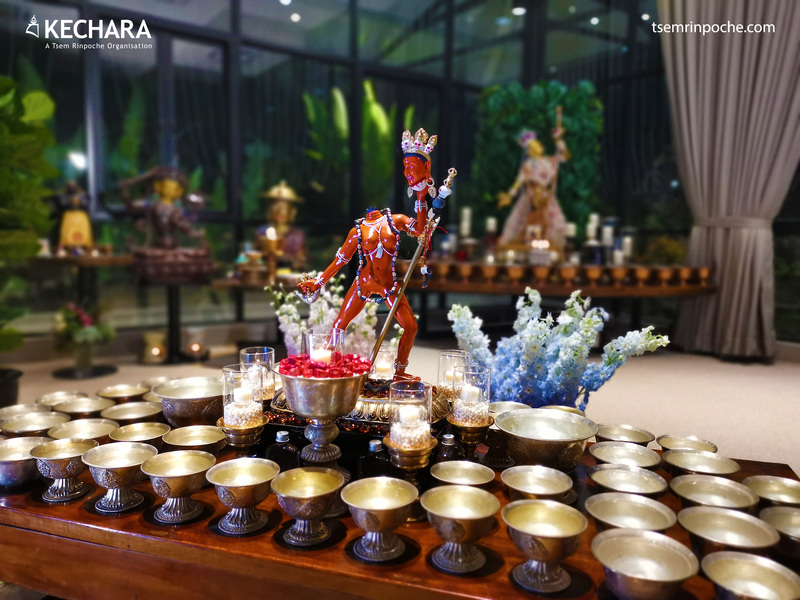 I unpacked the food offerings onto little plates to be offered and the temple caretaker helped to place it near Vajrayogini as we did our prayers. 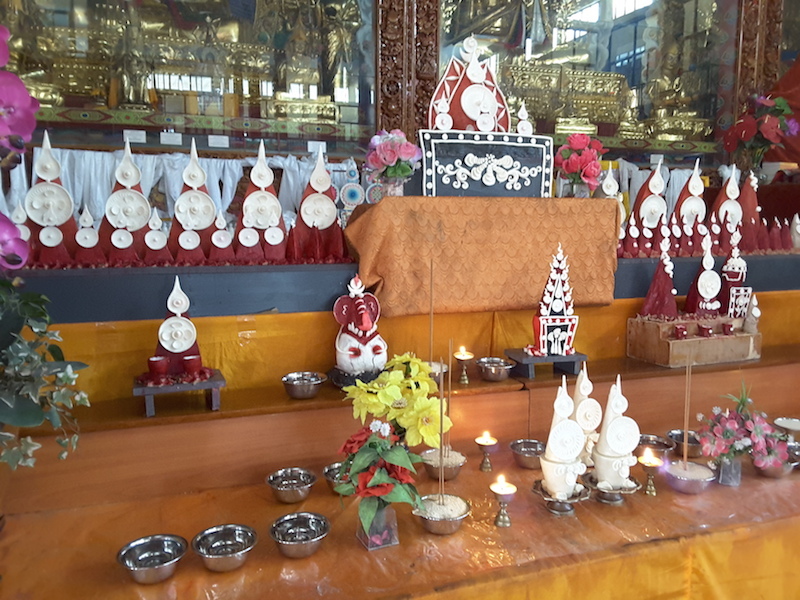 We made butterlamp offerings and in this temple, I told our parents to pray to have the merits to be reborn under similar circumstances to be near a teacher of authentic lineage of Vajrayogini and to receive her practice again. As we were making these aspirations and offerings, the temple caretaker screamed at Paul for taking pictures so close to the shrine and would not allow him inside. 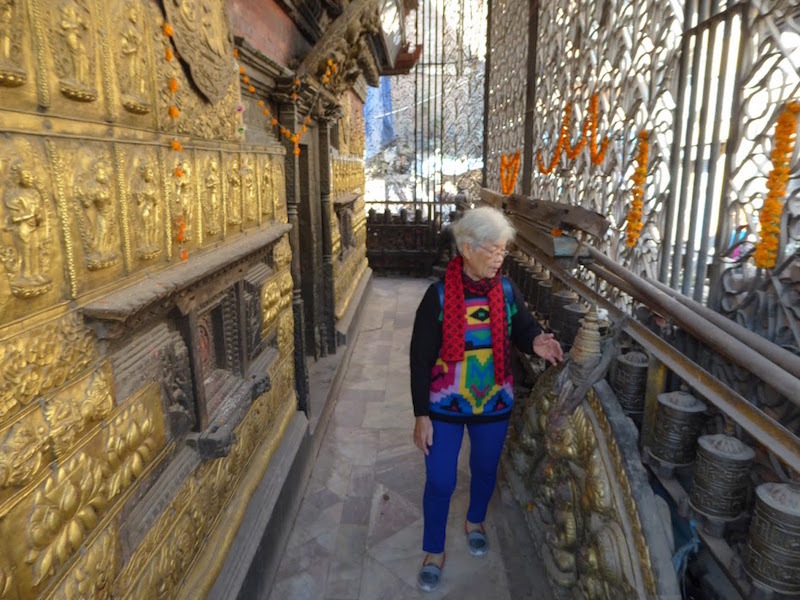 Nepalese are highly sensitive about people taking pictures of their sacred shrines. 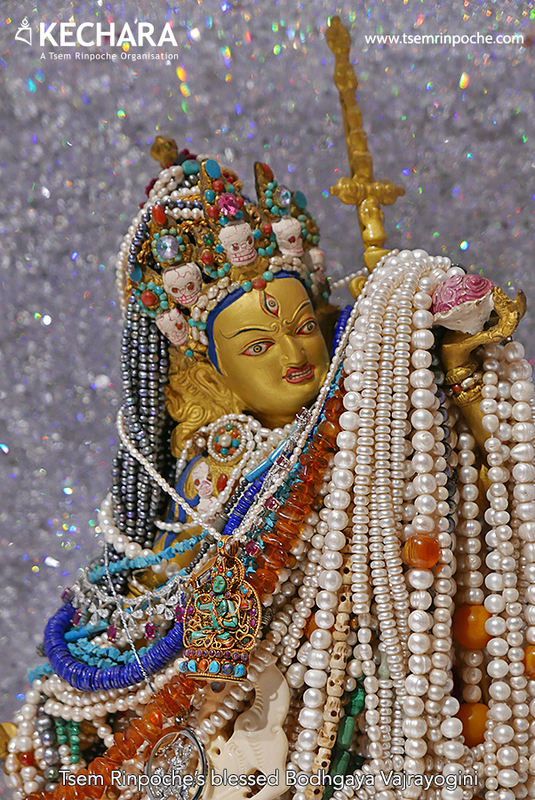 Just before exiting the temple, I offered one of my late mother’s jewelled earrings, and I asked the temple caretaker to help me place it on Vajrayogini herself in order to collect merit for her. 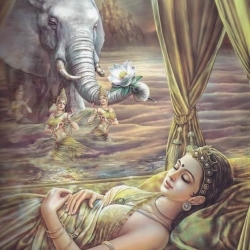 I gestured for him to place the earring on Naropa’s Dakini. 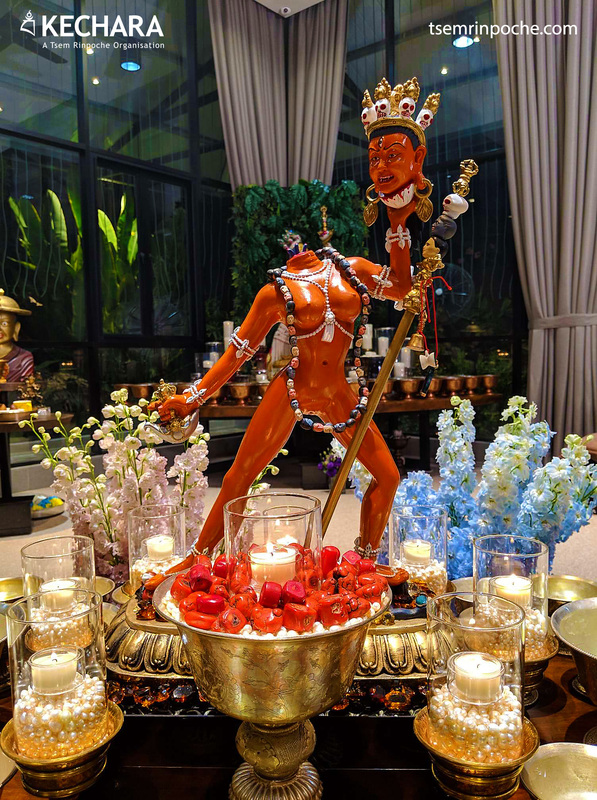 I prayed that she would be blessed to be connected to the Dharma in her next life and be connected to the Dharma and Vajrayogini. 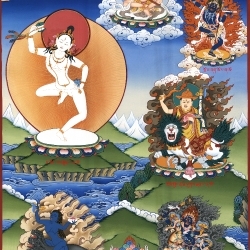 The main image of Vajrayogini is Akash Yogini or the flying Vajrayogini and on her left is Phamthing Vajrayogini and on her right is Vajravarahi. 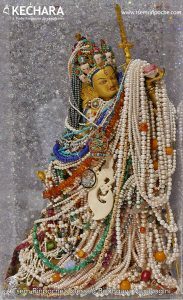 Naropa’s Dakini is enshrined on the right wall, and it is to this statue that I offered my late mother’s earring. 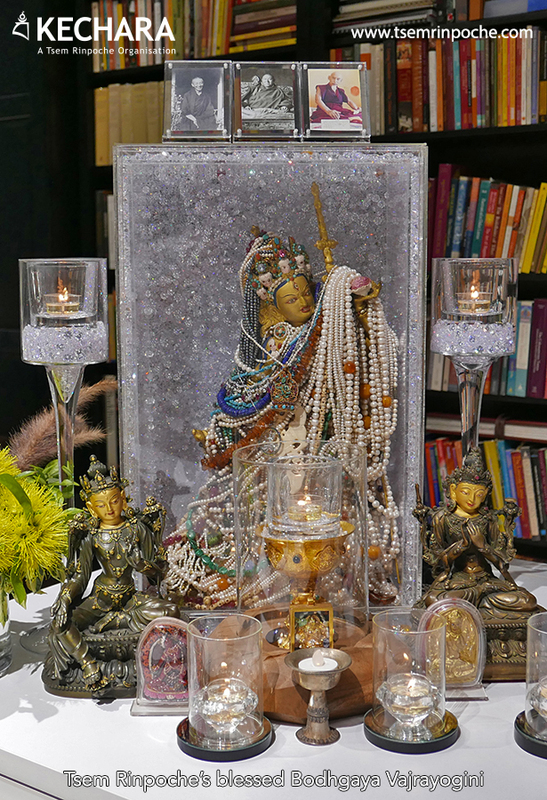 We made abundant offerings to the Sankhu Vajrayogini. We hired an SUV to take us up into the hills and into Sankhu because that would be the farthest destination. It is only about 17 kilometres but because the recent earthquake had destroyed the road, the journey felt much longer than 17 kilometers. At Sankhu, we were headed towards Gum Bahal, which is an ancient monastery situated on top of a hill that is power place of Vajrayogini. 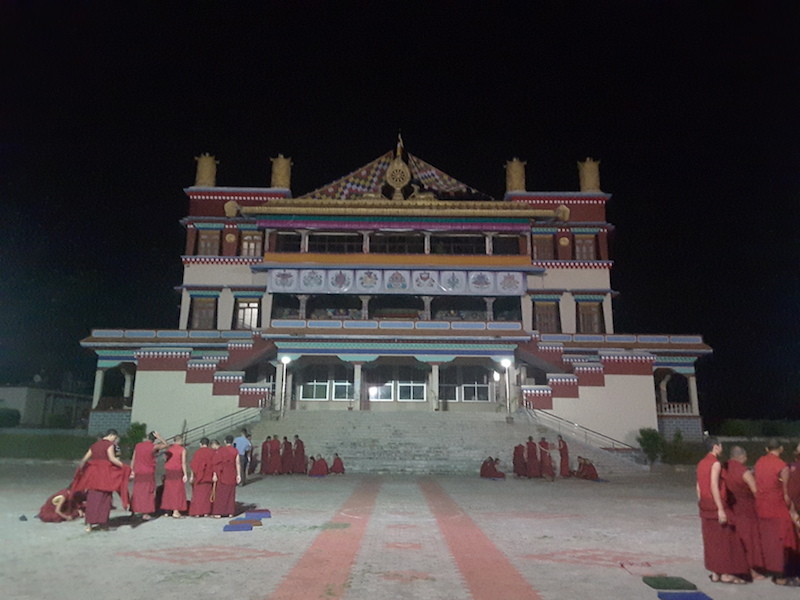 On a previous trip with Rinpoche, we had arrived at the bottom of a stairs late in the evening, and we had to climb a flight of stairs in pitch-black darkness with torches in order to get to the monastery. This time around, the driver drove us right up the hill and the road ended right behind the monastery. 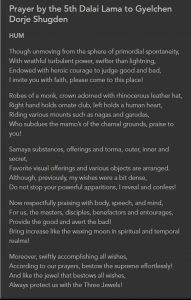 The monastery itself is a custodian of a special 4-armed Vajrayogini bearing a sword, lotus, skullcup and ritual chopper. 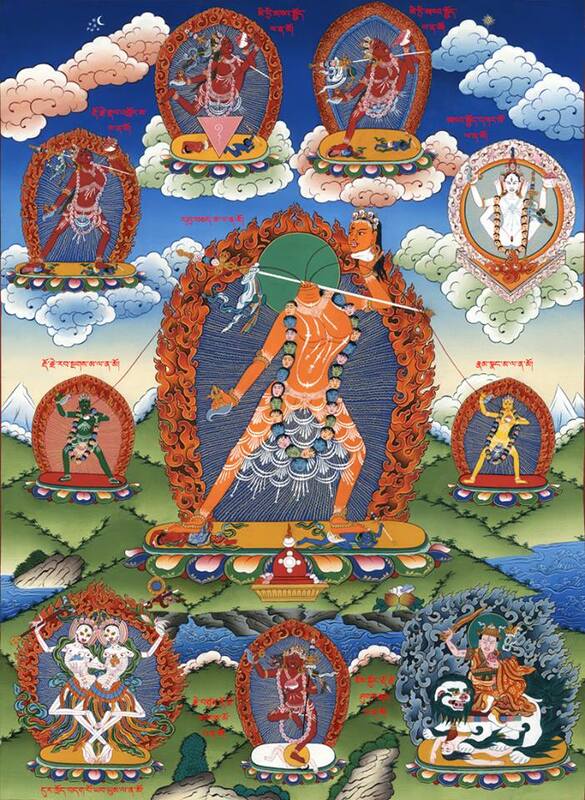 This form of Vajrayogini is known as the Khadga Yogini or the sword-bearing Vajrayogini. The statue in the monastery itself is a life-sized Khadga Yogini that is believed to contain the remains of a priestess of Sankhu that was a great practitioner of Vajrayogini. She was said to have become one with Vajrayogini, and she showed many signs of high attainments. Even at death, her remains bore remarkable signs and hence, they enshrined her within this statue. The local people bring this statue out yearly to parade her around town in a weeklong religious festival called the Vajrayogini Jatra. Due to the earthquake, the monastery was under repairs, and the statue was brought to a room facing the courtyard while the monastery was being restored. I unpacked offerings of food and apple juice. We offered butterlamps, prayers, mantras and especially an aspiration that I had guided them to make. 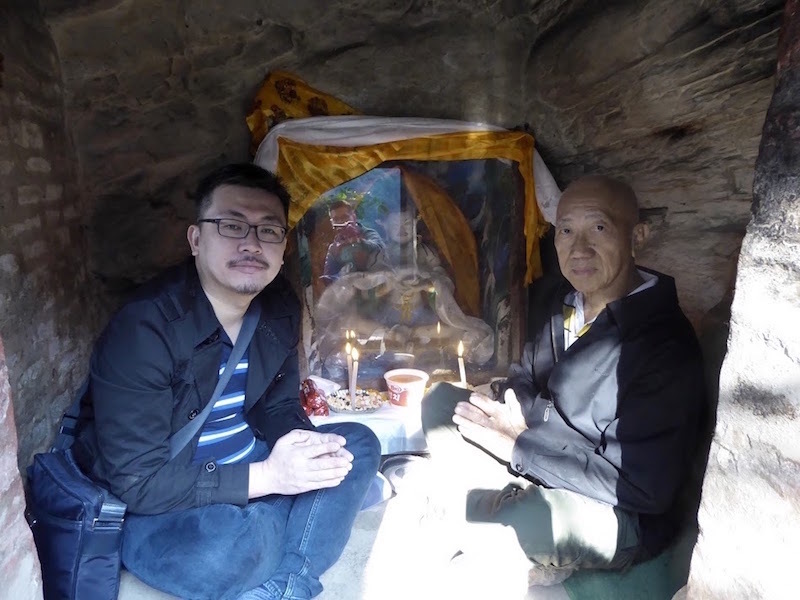 I told them that in this second Vajrayogini temple, we should pray in future lives that we will always meet Vajrayogini and receive her practice from a teacher of authentic lineage. 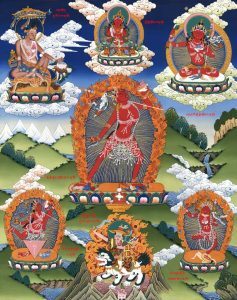 Then, we will gain great attainments through our Vajrayogini practice and enact the altruistic deeds of a Bodhisattva by benefitting many beings. A picture with the Sankhu Vajrayogini statue believed to contain the remains of the great yogini who had become one with Vajrayogini. 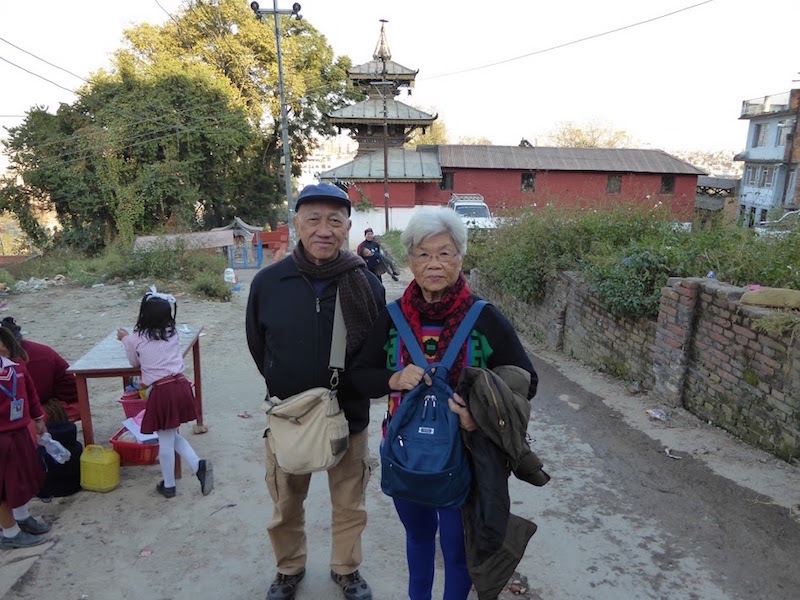 We made a dedication and took a walk around the courtyard of the monastery and down a small flight of stone stairs towards a twin pagoda shrines. 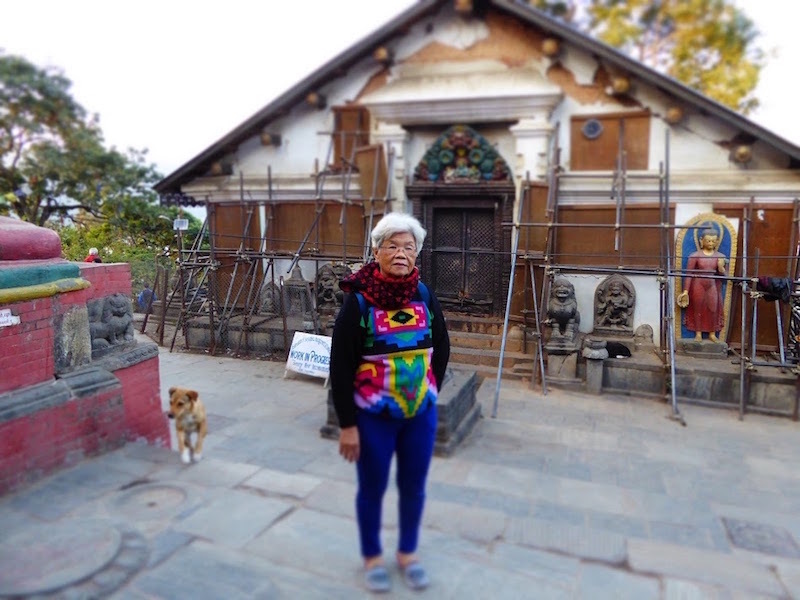 At the large of the two shrines, we discovered another very ancient statue of Khadga Yogini is enshrined within and a stupa is enshrined in the other smaller shrine. 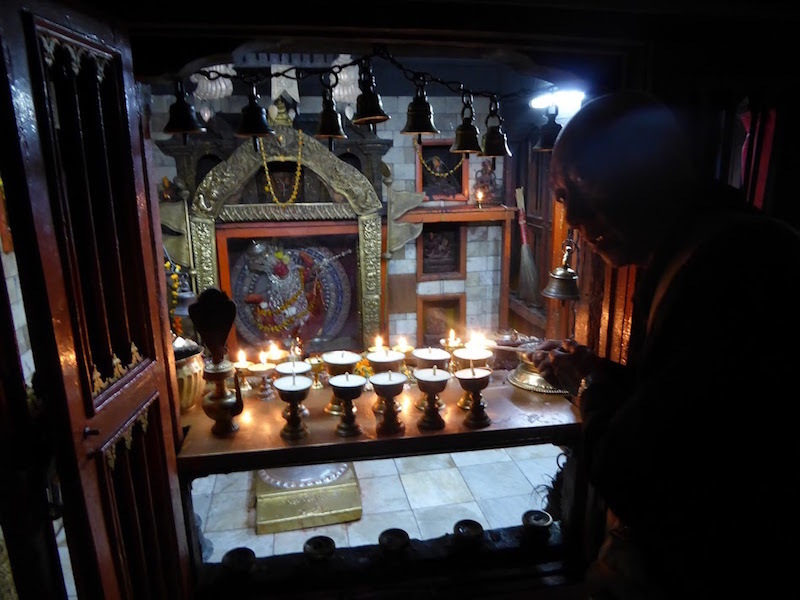 So, we paid homage to both shrines by offering butterlamps and reciting mantras at these two ancient shrines. 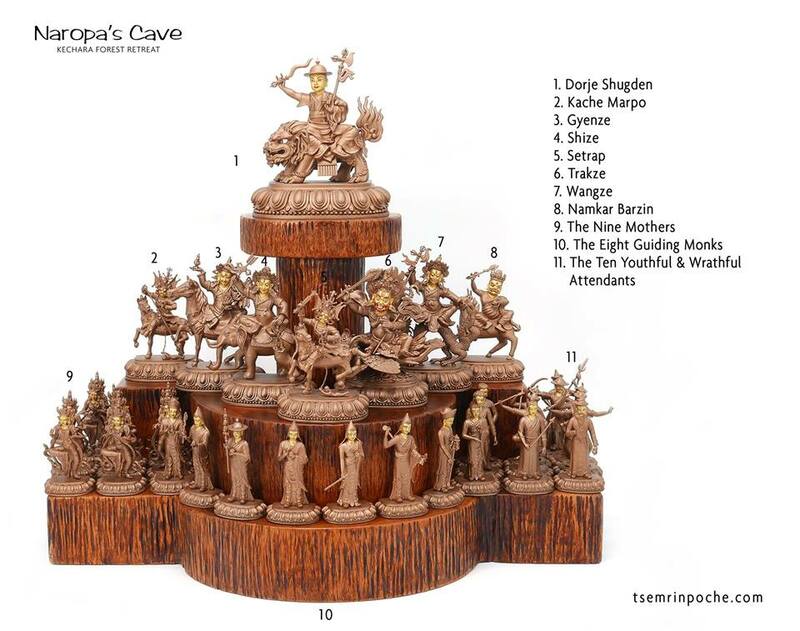 I recall that there were some caves nearby that were used by Tilopa, Naropa and the Nepalese Pamthingpa brothers. Unfortunately, we couldn’t visit these caves due to ongoing restoration works. 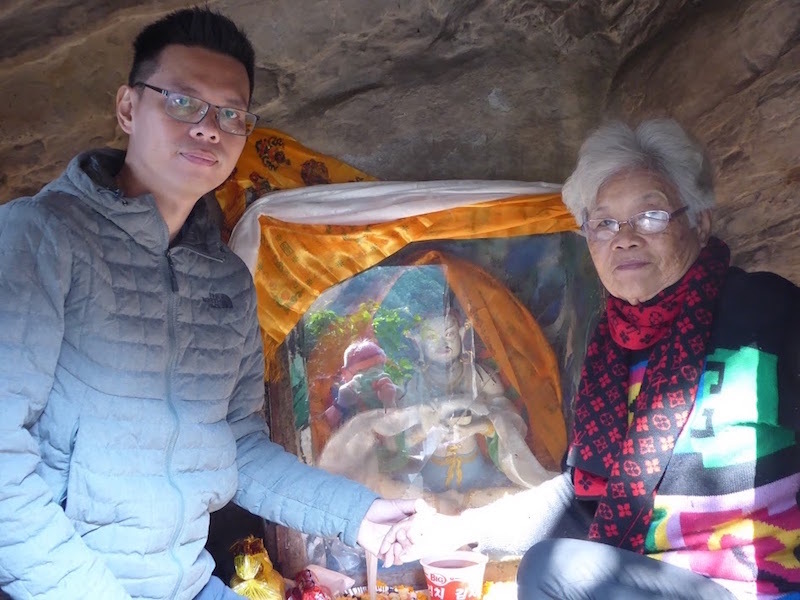 Paul and his mom were making offerings before the shrine to Vajrayogini in the aspect of Khadga Yogini. After Sankhu, we drove back to Kathmandu and went on towards Boudhanath. The Boudhanath stupa is reputed to be the largest stupa in the world. Traditional sources say that the great Boudhanath Stupa was constructed in the 5th Century CE. The stupa is believed to enshrine the relics of the previous Buddha, Kashyapa Buddha. We arrived at the Boudha Stupa when they were about to re-consecrate the stupa after restoration works. The stupa was damaged during the recent earthquake. 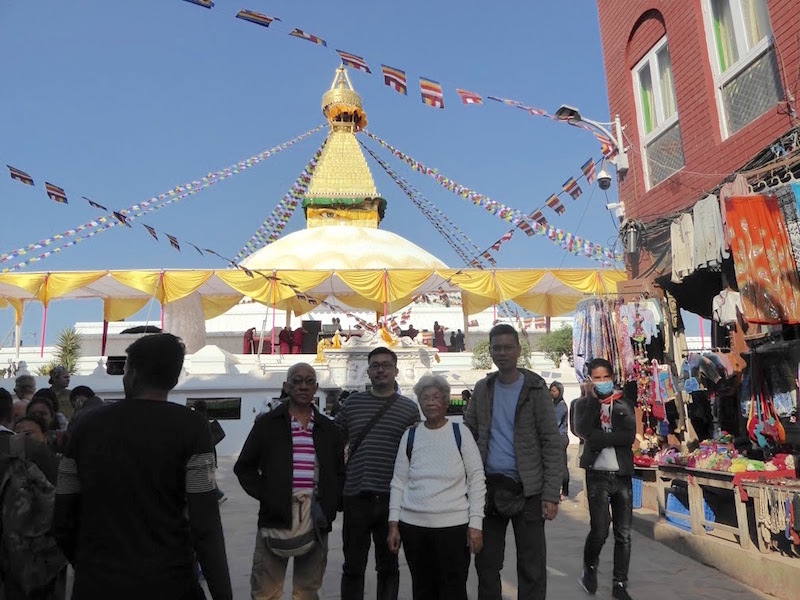 According to legend, a long time ago Jadzimo and her four sons built Boudhanath, which is known as Chorten Jarung Khashor with money that they saved from their wages. When the stupa was consecrated, it was believed that 100 million Buddhas dissolved into it, and it has the glory of being filled with sacred relics. It is believed that the stupa was built on top of the cremation ground called ‘Spontaneously Amassed’, which was one of the Eight Great Cremation Grounds. 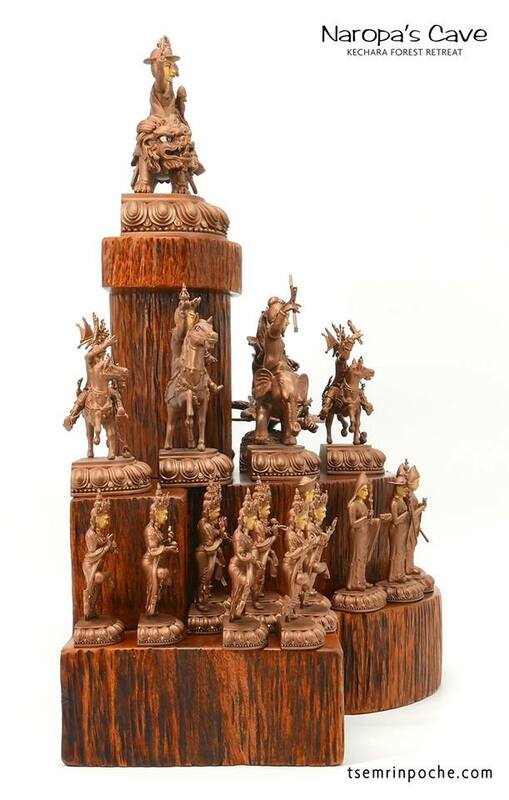 The name Jarung Khashor refers to another legend of its origin in which a courtesan who wounded the pride of the wealthy and powerful by managing to construct this stupa to the Buddha with the permission of the king. The jealous nobles requested the king to demolish the Stupa over petty reasons, but the king replied that “Once authority to build has been given, it cannot be retracted”, which is reflected in its name, ‘Jarung Khashor’. Guru Rinpoche while in Samye monastery told another tale of the Boudhanath Stupa. 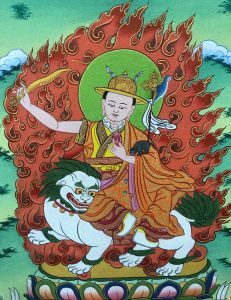 He explained that the aspirational prayers of the benefactor Jadzima’s sons, created the cause for them to be reborn as the principle force behind the spread of the teachings in Tibet – Guru Padmasambhava, the King Trisong Detsen, Santaraksita and Ba Salnang. When they met in Nepal and Tibet for the very first time, it felt like a reunion. 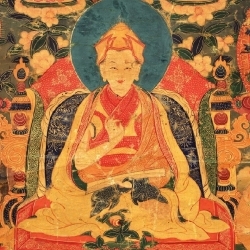 Guru Padmasambhava foretold that the Stupa would fall into ruin and a certain tulku with a certain special characteristic would restore the stupa. It turns out that Sakya Zangpo discovered the ruined Stupa in the 16th century and undertook the task to restore it to its former glory. 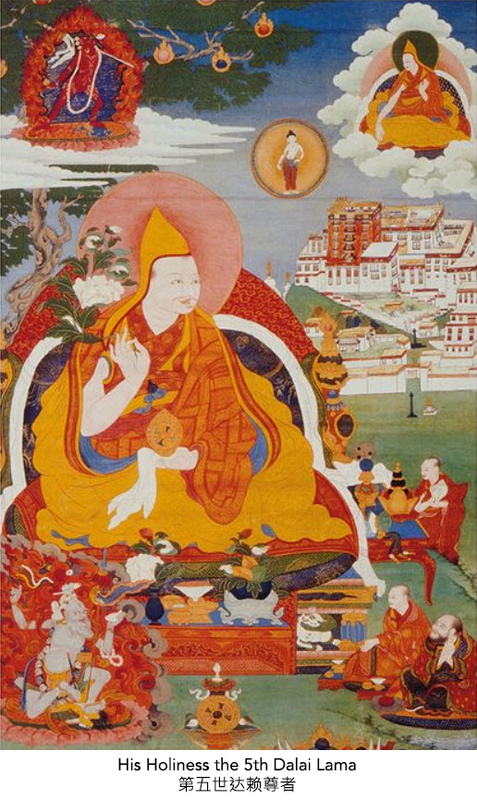 In 1505, he also contributed towards the restoration of Swayambhunath. Today, the Boudhanath Stupa is a World Heritage Site and Buddhists and tourists from around the world come to visit this ancient monument. Most people who come to visit, would be circumambulating the stupa, and some would be within the walled enclosure of the stupa and performing prostrations towards the stupa. The stupa itself is surrounded by shops filled with jewellery, statues, thangkas and not to mention the cafes, restaurants and monasteries and temples of various Tibetan Buddhist traditions. We came here to look for a place to eat before we did our devotional rounds around the stupa. After circumambulating with the growing crowd as more and more older Tibetan pilgrims came out to circumambulate the stupa in the evening. After our third round, we called it a day and returned back to our hotel. This unique Vajrayogini with her left leg thrust skywards is from a pure vision by the Nepalese master Phamthingpa. Pharping is a good 19km south of Kathmandu city and is a major Buddhist site due to a number of sacred sites. 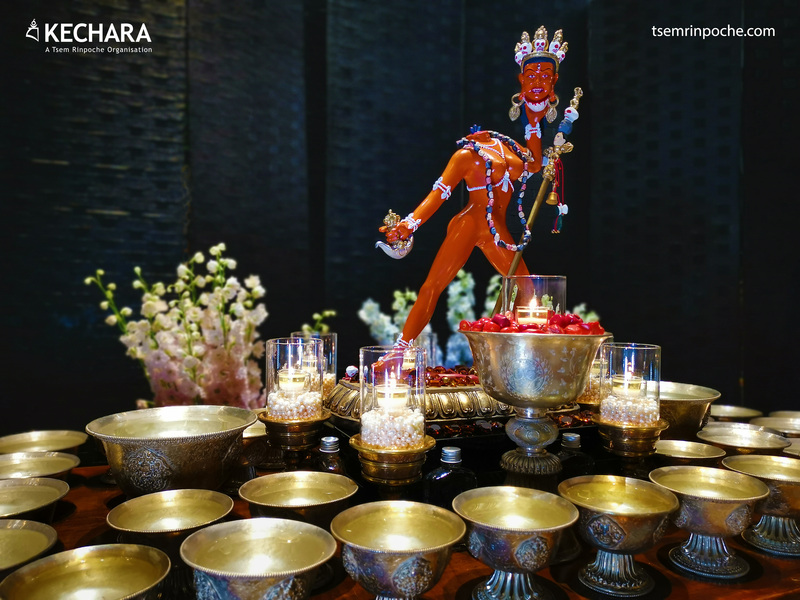 There are three places that are in the vicinity of each other and the ancient Vajrayogini chapel is one of the main reasons we are headed to this place. 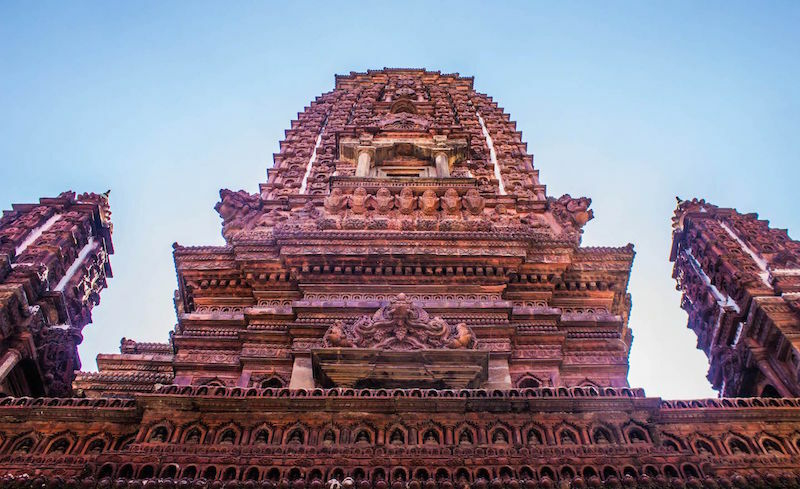 On my previous trips, we stopped by the Self-arising Tara temple first and then we walk up the stairs to Asura caves and finally descending down another flight of stairs to the Vajrayogini temple. This time around, the car we rented brought us straight to the Vajrayogini temple. So we approach the temple and walked upstairs to the Vajrayogini shrine, and I could see that the caretaker really cleaned up the place. It was a lot cleaner than the last few times I came. The inner sanctum sits an ancient statue of Vajrayogini with her left foot thrust skywards. This form of Vajrayogini is known as Phamthing Vajrayogini, Uddhapada Yogini or Indra Yogini. 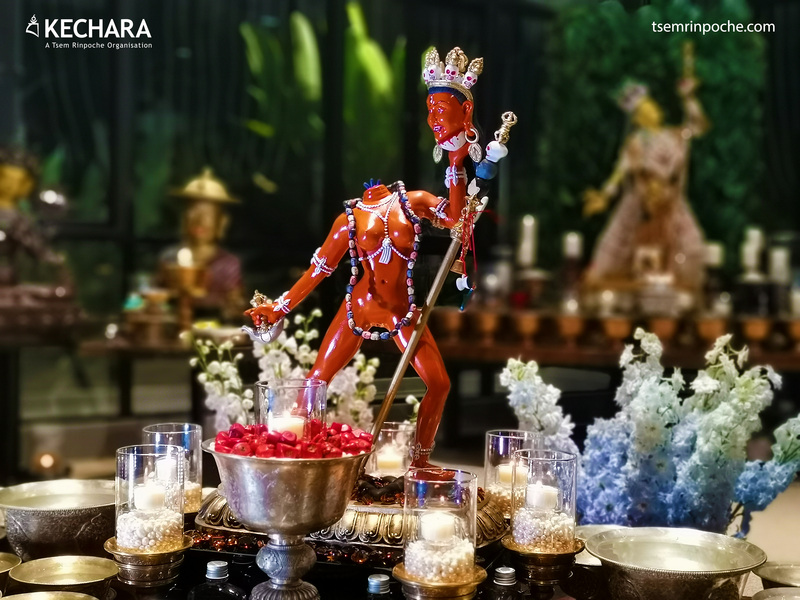 Apparently, this form of Vajrayogini appeared to the master Phamthingpa in a vision, and although it is unclear if this statue belong to Phamthingpa or not but this statue is known to have miraculously spoken. 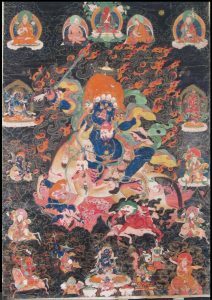 The 11th century Nepalese master Phamthingpa was one of the greatest teachers of his day and was also known as the great scholar Vagishvarakirti. 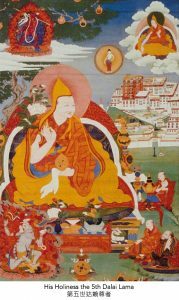 He studied under Naropa for nine years, receiving the transmission of the Cakrasamvara and Hevajra Tantras amongst others. 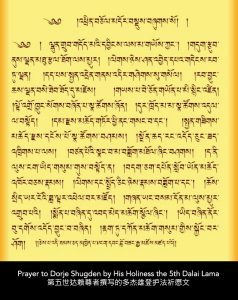 Even his brother, Dukhorba studied under Naropa for five years and his youngest brother Thangchungpa was a practicing Tantrika as well. 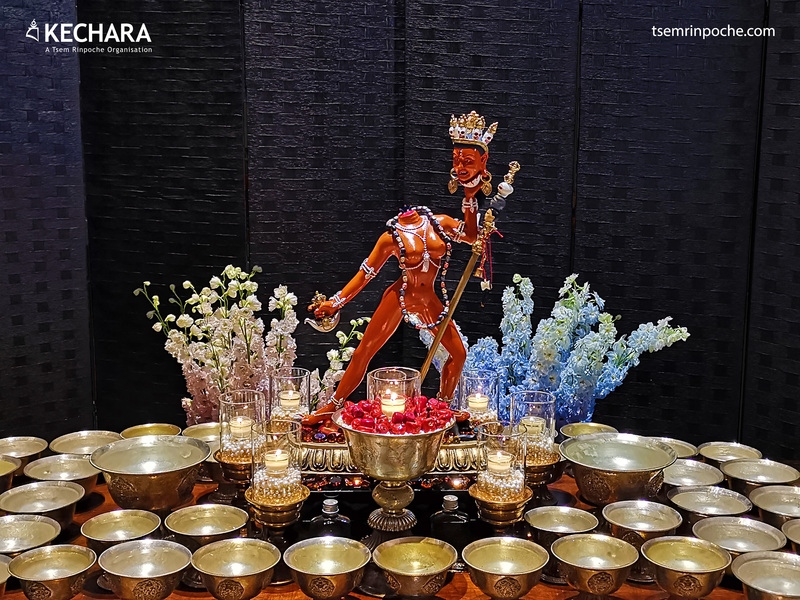 Naturally, we brought lots of offerings to be offered to Vajrayogini, which we offered via the caretaker along with mantras, prayers and aspiration. It is at this place that I guided our parents to make the aspiration that upon receiving Vajrayogini in our next life; we master it and become completely enlightened with Vajrayogini’s meditations and practises. It is to master her meditations and practices and thereby proliferate it to others. 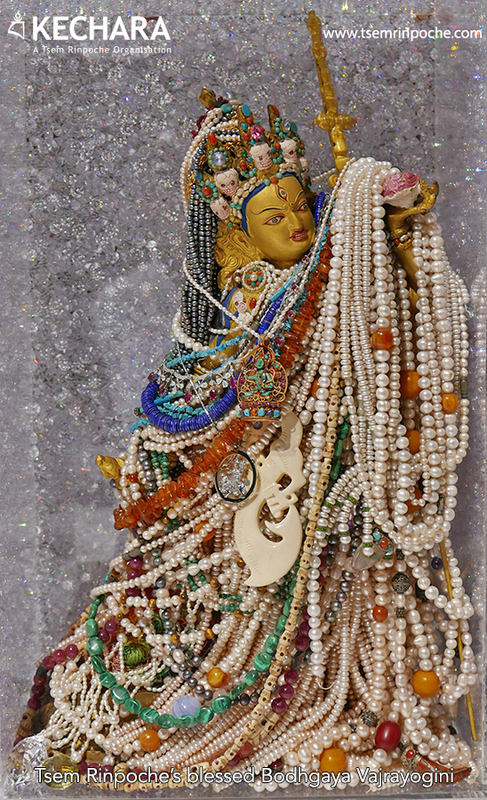 After everything was done, I took out the other jewelled earring from my late mom and gave it to the caretaker to be placed onto the statue of Vajrayogini. 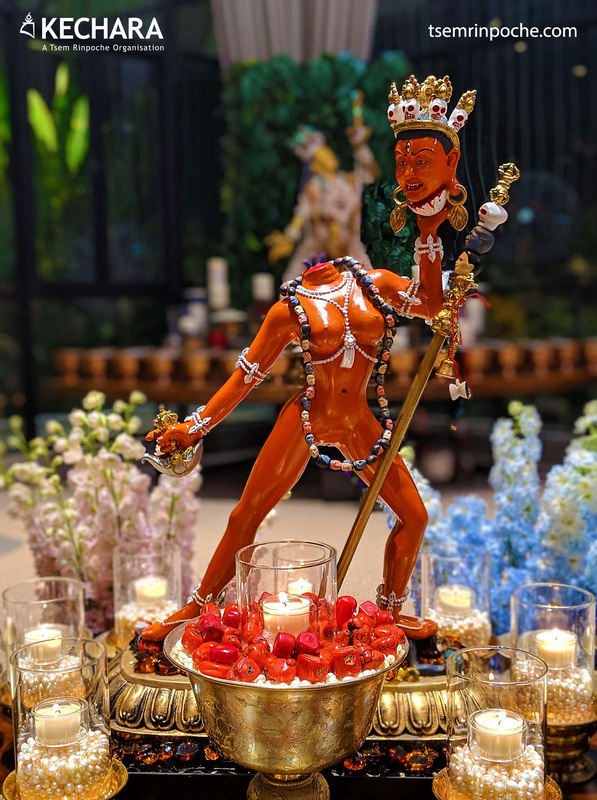 I prayed that my mom would be blessed by Vajrayogini to have the merits to meet the Dharma again and specifically meet Vajrayogini in her next life. 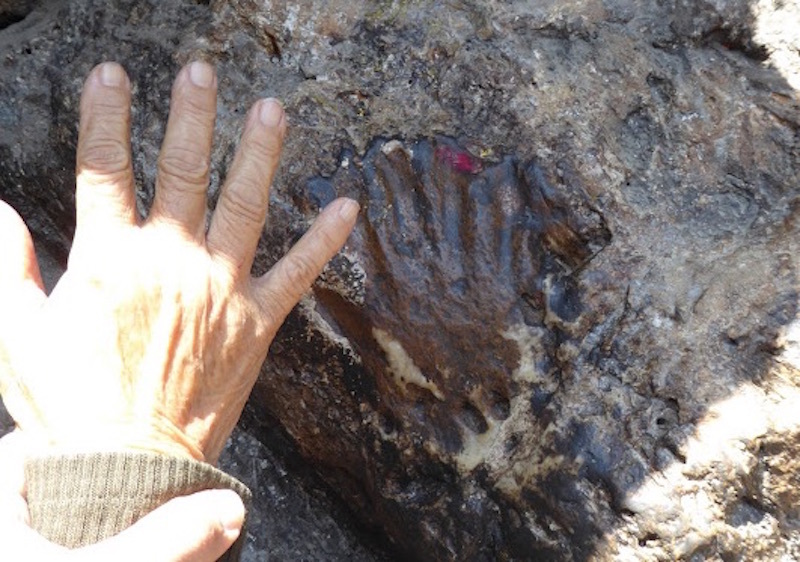 The sacred handprint of Guru Rinpoche is just next to the mouth of his retreat cave. 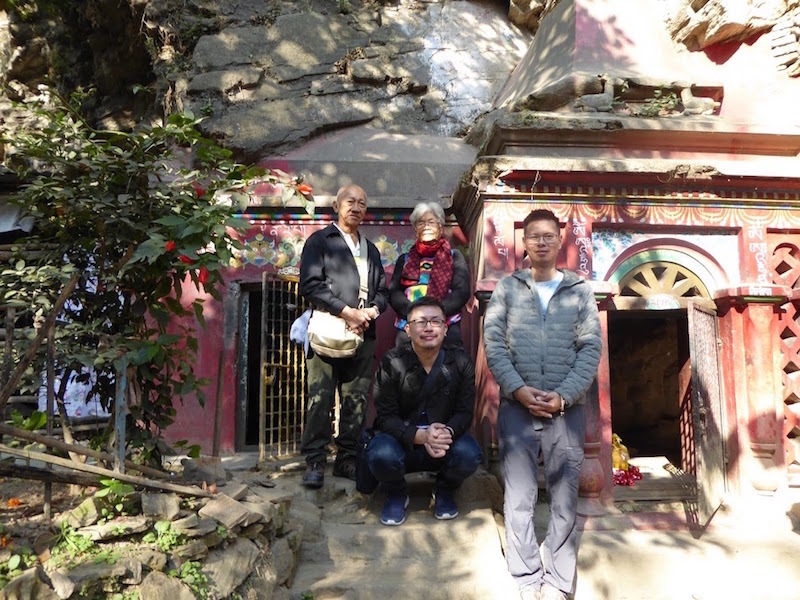 Our next destination was a Nyingma monastery built around a single cave called the Asura Cave. This monastery is approachable only on foot by climbing up the hill from the Vajrayogini temple. After a short flight of steep steps, we arrived at the back of the monastery. 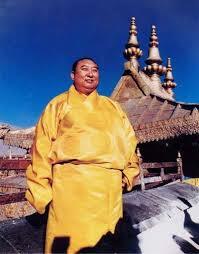 When we arrived, the nearby prayer halls were packed and it seemed that Chokyi Nyima Rinpoche was giving teachings. Nonetheless, we managed to enter the cave to offer our prayers, mantras and aspirations. 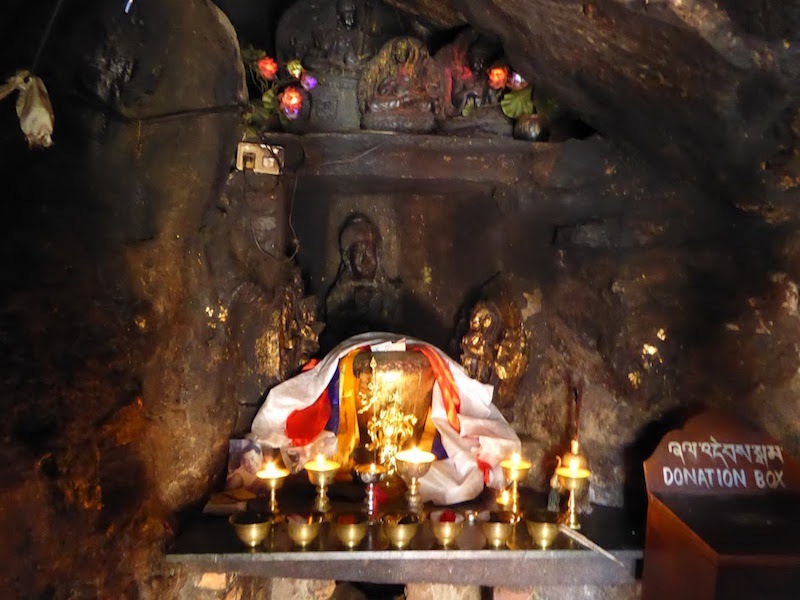 There is a darkened image of Guru Rinpoche, Yangdak Heruka and Vajrakilaya on a shrine with the cave. 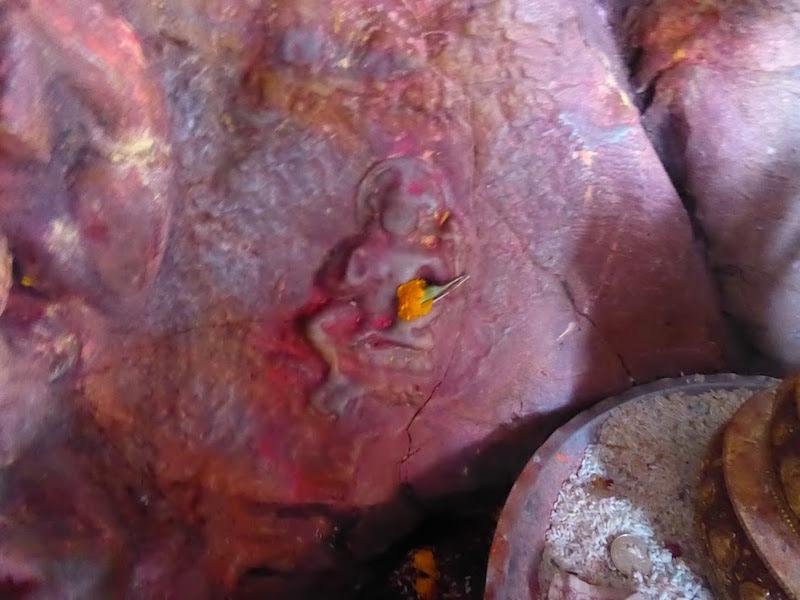 There is a handprint of Guru Rinpoche by the side of the mouth of the cave, sealing his blessings there. It is believed that Guru Rinpoche achieved high realisations through his practice here and he was able to imprint his hand into solid rock. This self-arising Tara image seems to get clearer each time I visit this chapel. 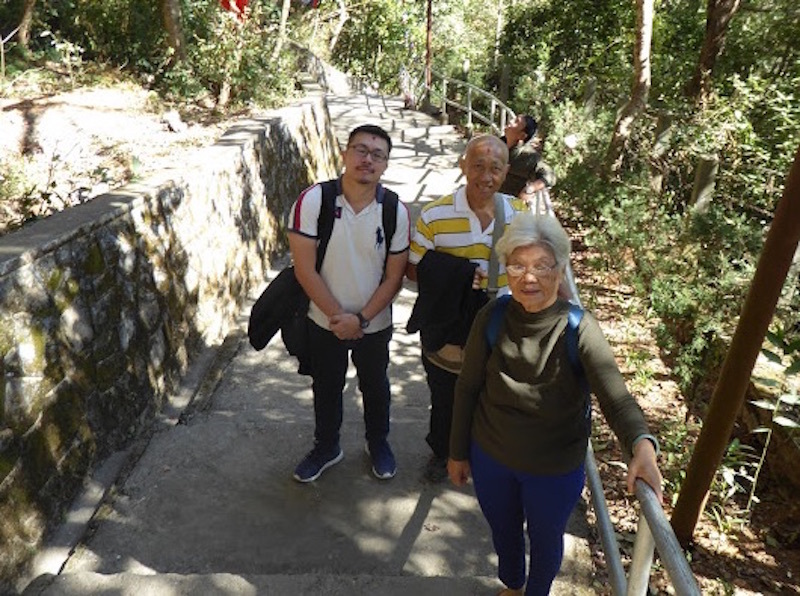 In order to get to the next destination, which is the Tara temple, we walked to the front of the monastery where there was another flight of steps downhill. Descending down the steps, we came across a Nyingma prayer hall to the left and a small little Tara chapel on the right and a chapel to the Tselha Namsum or the three buddhas that grand long life – Amitayus, White Tara and Namgyalma. The Tara chapel is a shrine to a rock and from within the rock, a large image of Ganesh had arisen from the rock. Upon first sight, we couldn’t see Tara but on closer inspection, we saw a small but distinct image of Tara rising from the side of Ganesh. These images were not carved but have arisen from within the rock itself. It is said that great meditators and holy beings blessed the place and hence, Tara had chosen to manifest here. There was a single monk there when we visited and he was doing his Tara recitations. Naturally, we made some offerings to him, offered butterlamps, Tara mantras and rubbed our malas on Tara’s feet, hopefully to glean some blessings into our malas. We didn’t stay very long as a whole group of Tibetan pilgrims came shuffling in and crowding the place up. The Mahabouddha Stupa is a scaled down replica of the great Mahabodhi Stupa at Bodhgaya, India. The next day, we took a ride to Patan which also known as Lalitpur, an ancient city known for its beauty. 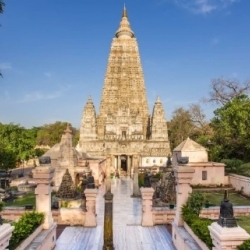 We were headed to the Mahabouddha, a scaled-down replica of the Mahabodhi stupa at Bodhgaya India. 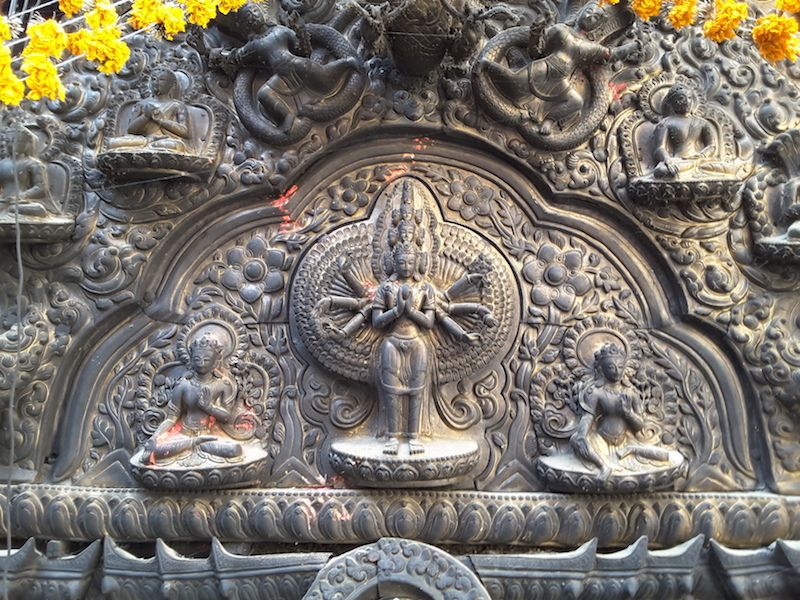 This is situated in the old part of town, not far from the Patan Durbar Square. 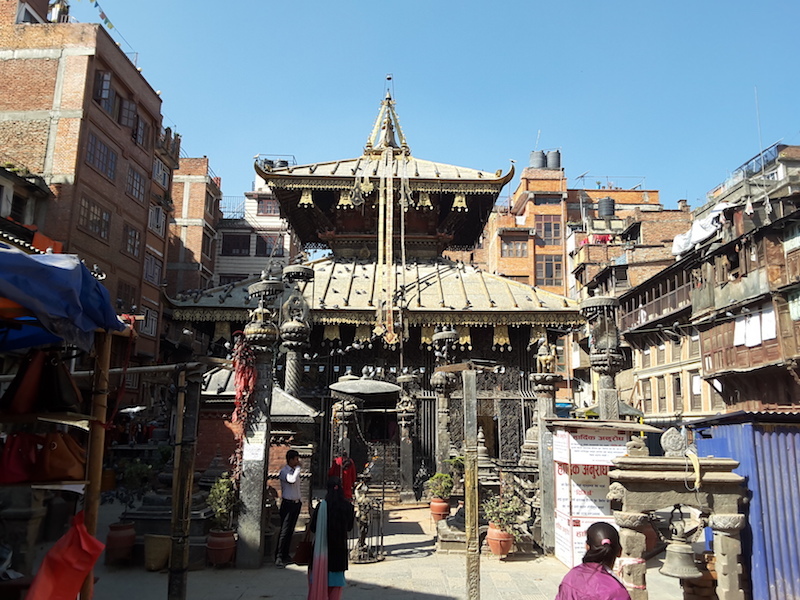 The stupa is not visible from the road and you have to walk a narrow alleyway between shops till you arrive at a little entrance to the courtyard. The Mahaboudha stupa is built in the middle of a courtyard which enshrines a statue of the Buddha in it and apparently, the statue was brought back from Bodhgaya itself. The stupa was originally built in the 17th century by the artisans of the city for those who could not travel down to India for pilgrimage. 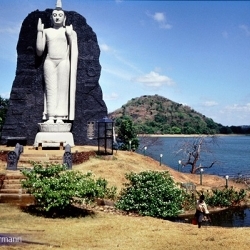 This is a beautiful shrine to the Buddha but this is not exactly our main destination. 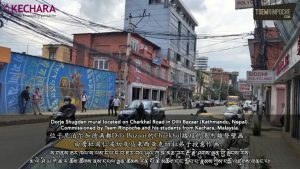 We were here because there is a Vajrayogini chapel just opposite from the Mahaboudha stupa. The chapel is accessible through a flight of steps that overlooks the stupa. 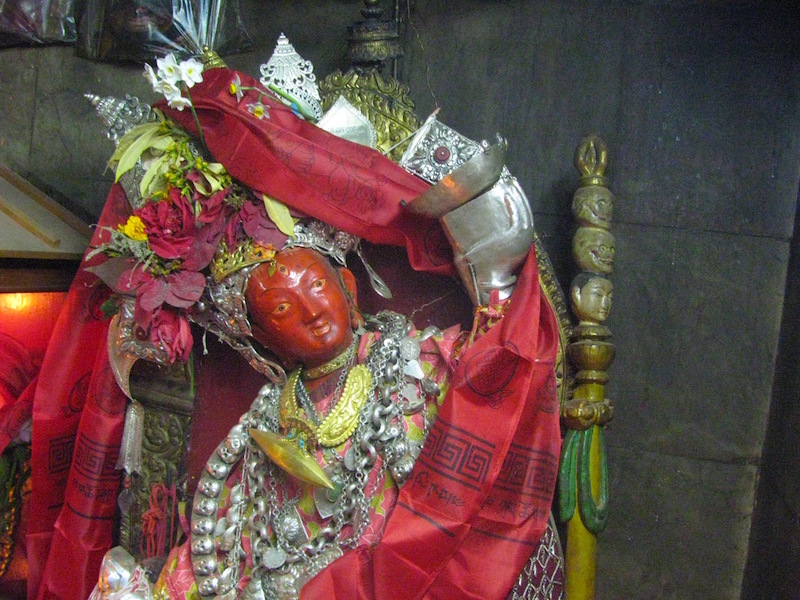 The main image of the shrine is the flying Vajrayogini statue. We did the same here in this chapel by offering food, butterlamps, mantras and aspiration. 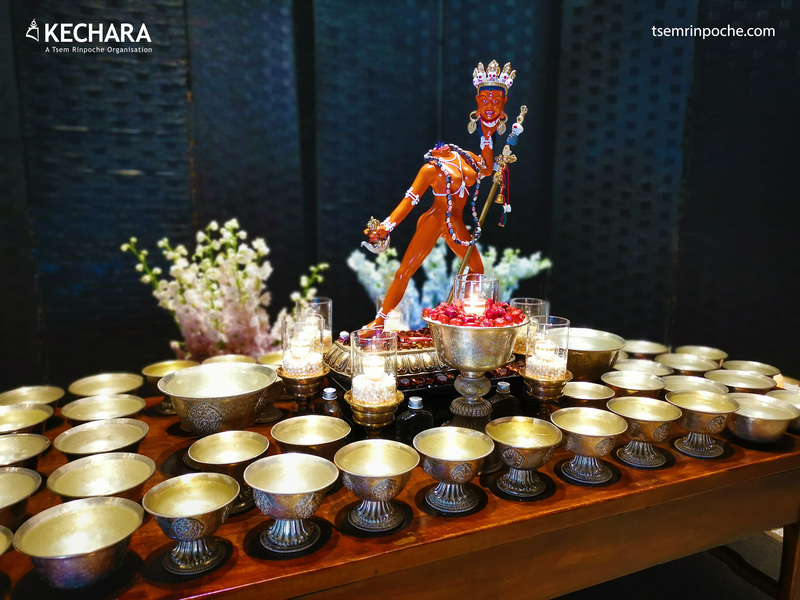 This was the last Vajrayogini temple on this pilgrimage and I told our parents to pray to be completely enlightened with Vajrayogini’s practice and to ascend to Kechara Paradise while bringing many beings along. That should be our aspiration just in the same manner of how great mahasiddha who liberated many after they themselves gained great attainments. 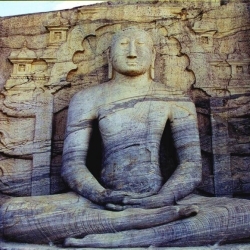 This is the Buddha statue that originated from Bodhgaya, India. 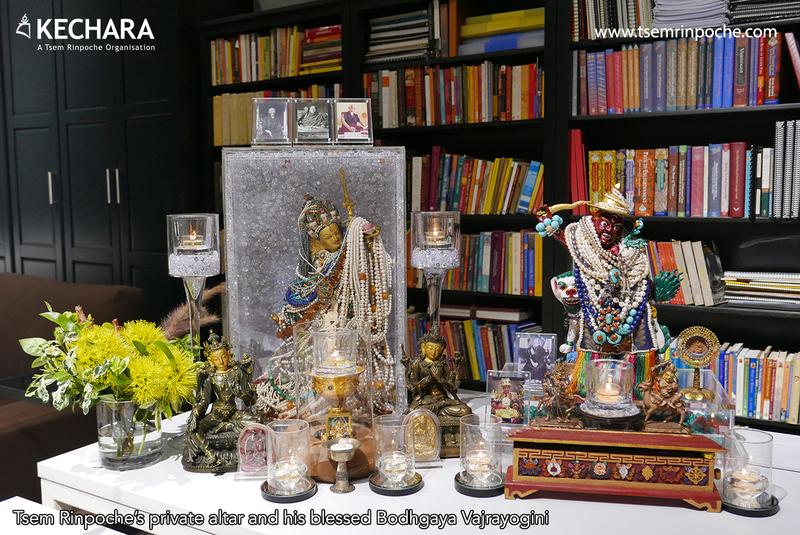 Offering beautiful butterlamps to the sacred image of the Akash Yogini or flying Vajrayogini. This is known as the monkey temple due to sheer amount of monkeys living on the hill. 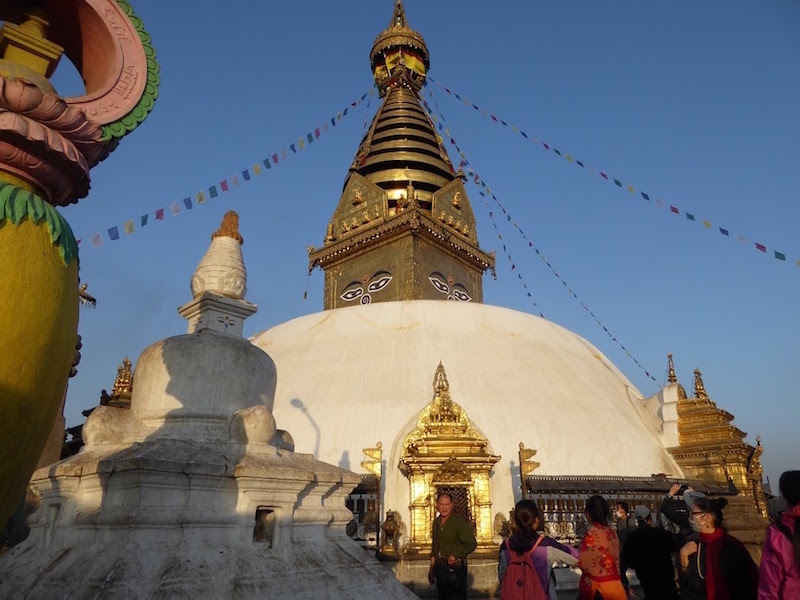 This is the second largest stupa in Nepal and perhaps one of the most iconic because it is situated on top of a hill. Unfortunately, the earthquake devastated the temple and destroyed quite a number of its structures and temples surrounding the stupa. The stupa itself had survived the earthquake unscathed. There were three places we had to go and the first one is Manjushri’s site. This is on one side of the hill that is just a platform with prayer flags and some prayer wheels. 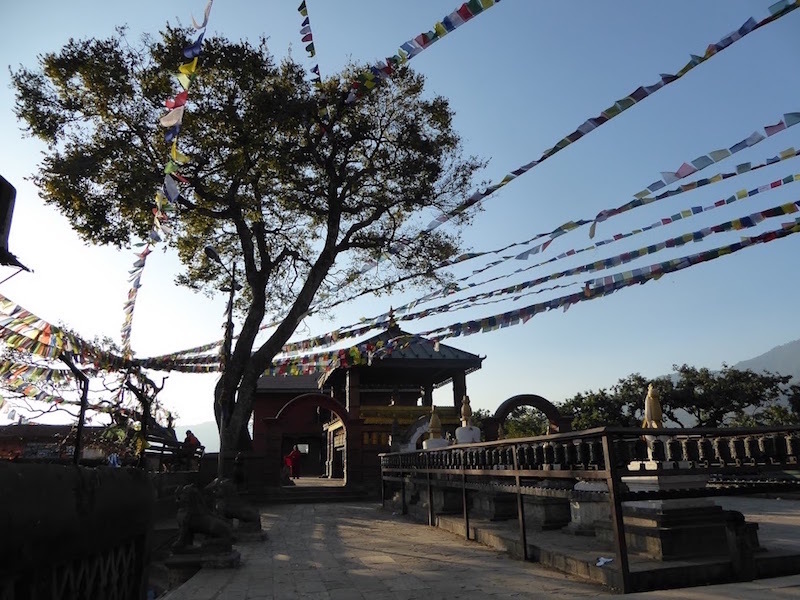 This place is believed to be where Manjushri would appear to teach the local gods and celestial beings above the ground. We are unable to see this but those with psychic abilities or attained are able to perceive this. For the Nepalese, this is the site from which Manjushri stood and wielded his great flaming sword to carve out Kathmandu Valley in ancient times in order to drain a great lake. Needless to say, we offered several butterlamps and recited Manjushri’s praise and mantras in order to tap in his wisdom here. The convergence of prayer flags and prayer wheels is the only thing that identify the location of the site where Manjushri is said to teach the local deities. 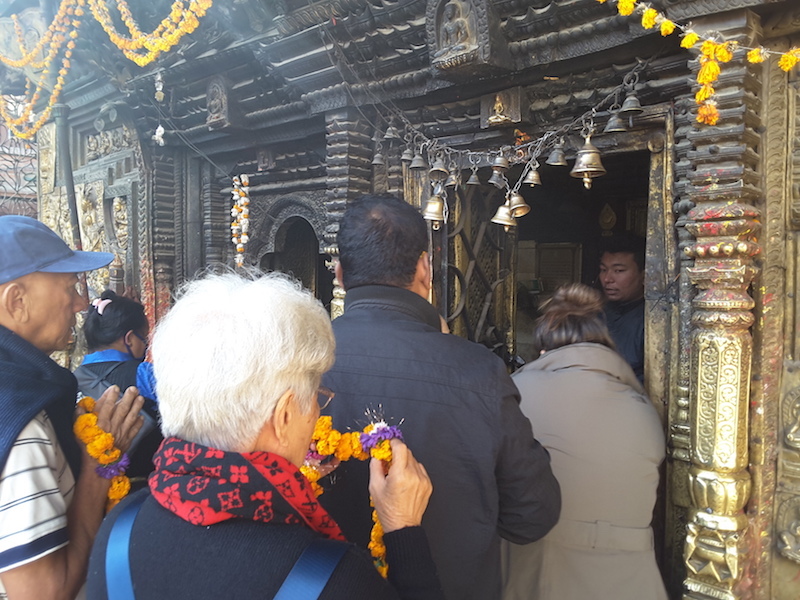 The next destination was the Swayambhunath stupa itself and we circumambulated the stupa 3 times, while rolling the prayer wheels, and peering into the niches that contained shrines to the Dhyani Buddhas and their consorts. After that, we walked past a group of smaller stupas and stroll down towards an old building. Unfortunately, the earthquake damaged the building so badly that scaffolding was erected to support the structure and prevent it from collapsing. This is the temple of the doors, which is believed to be the doors to the underground system of caverns – the main doorway into the abode of the 16 Arhats known to bestow long life. Hence, we did some prayers and aspirations for long life, especially for our parents. After that, we left Swayambhunath hill. In order to tap into the blessings of the Swayambhunath Stupa, we circumambulated the stupa clockwise while reciting mantras. Paul’s mother stands in front of the temple of the doors. It was damaged by the recent earthquake and the entire building is held up by metal scaffolding. Taking a sacred picture with Naropa along with a feast of offerings that we have prepared for him. 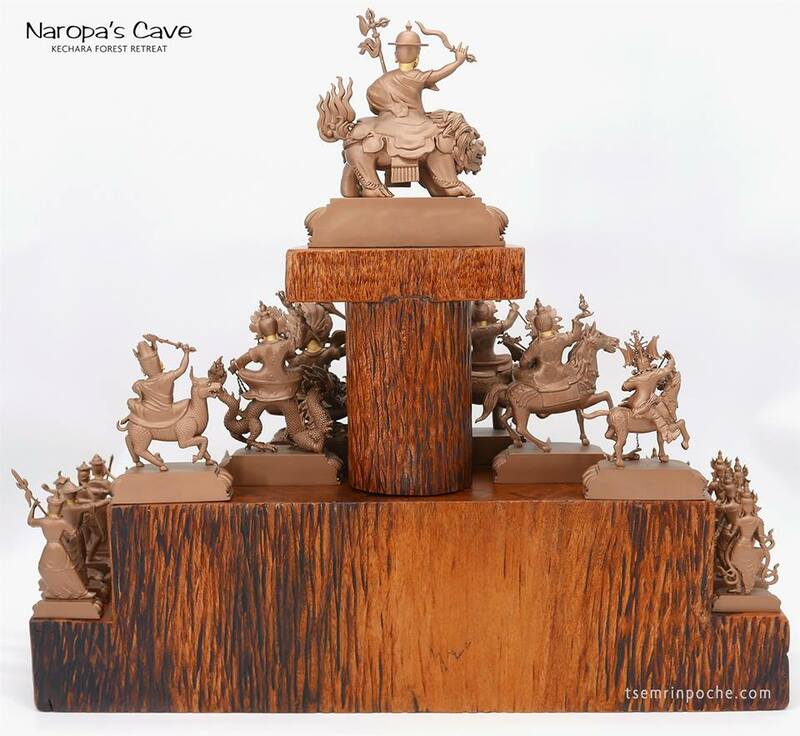 On the last day, we paid a visit to Naropa’s and Tilopa’s cave near Pashupatinath temple complex. 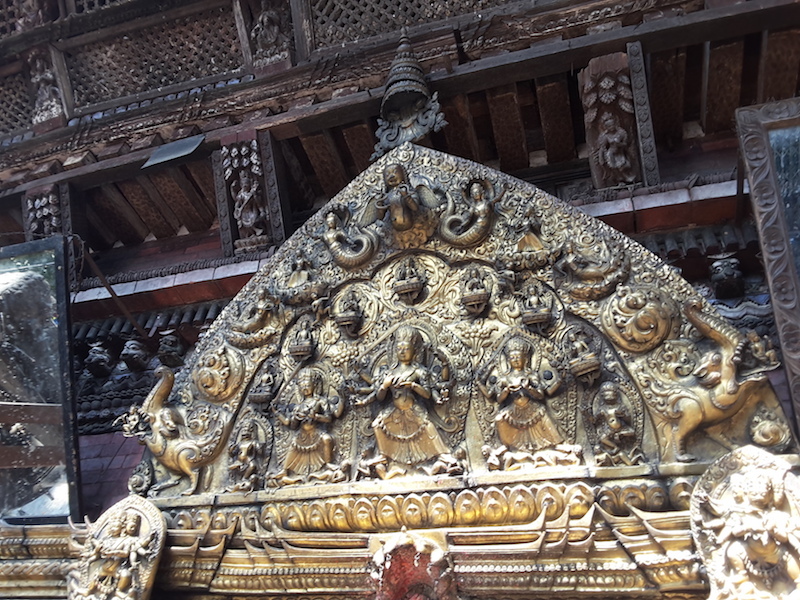 The temple complex is one of the largest Hindu temples in Nepal and one of the most important in the Hindu world. It was built along the Bagmati river and had ancient platform-ghats along the river where the deceased are cremated in plain sight of all who walk pass. We could see that a Hindu Brahmin priest was preparing an old lady for cremation. 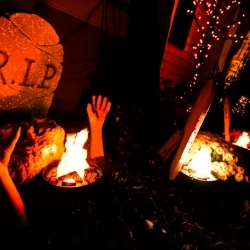 Just witnessing the cremation was a contemplation of death and impermanence. We walked across a bridge towards the temple and along the ghats towards the far end of the river where there were some dwellings and caves by the side of the river. Sadhus probably lived in these dwellings for centuries and two particular caves were traditionally attributed to the Buddhist yogins, Tilopa and Naropa. Their caves were cemented over and images of both masters were placed in them to commemorate the spot in which they had meditated. Naropa most likely meditated and received visions of Vajrayogini here in this very cave. This was also where he lived and served his guru by begging for alms and washing his clothes by the river below. 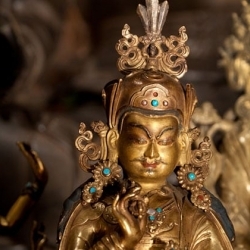 A story of Naropa’s diligence and devotion to his teacher was appropriately told as it was the perfect story and example of devotion to a teacher. Hence, our aspirational prayer was to develop such devotion towards an authentic teacher so spiritual attainments could easily come. 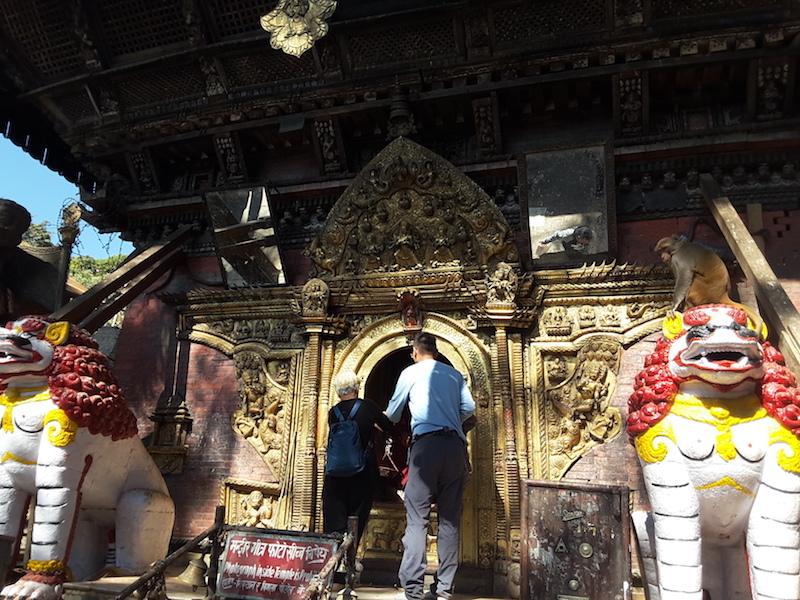 The pilgrimage was one that connects the four main Vajrayogini temples along with other power places and the offerings and aspiration generated at these places are very powerful. 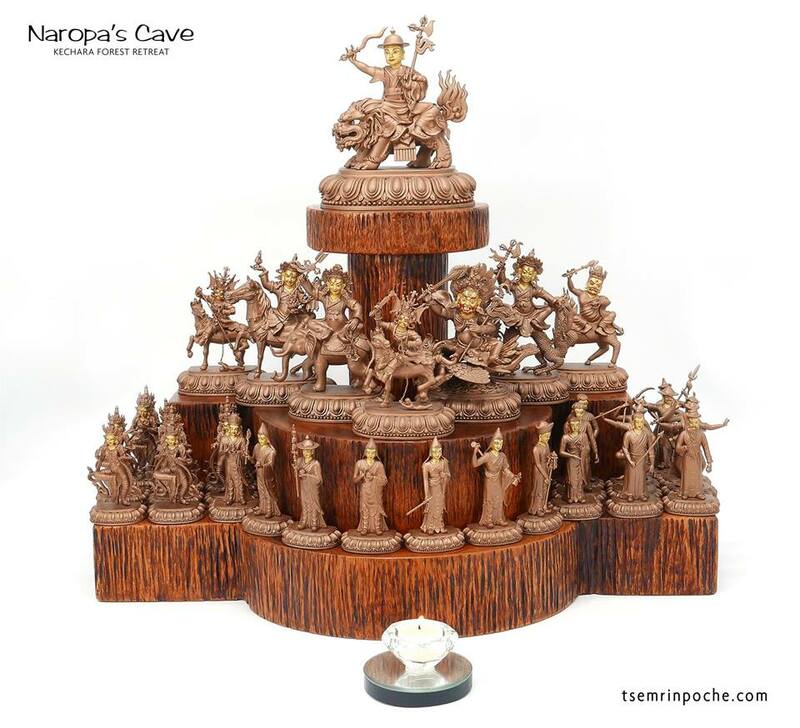 Hence, at each temple the aspiration is a unique one and it is about praying to meet a guru with authentic lineage, receiving Vajrayogini’s practice, becoming attained through her practice, benefitting many beings through her practice and finally ascending to Kechara Paradise and bringing many beings along to Kechara Paradise. It is hoped that these would plant powerful spiritual seeds for my father and for Paul’s mother as well. Since, they are older and hence closer to death, this would be good preparation for the eventual step that all of us have to take. 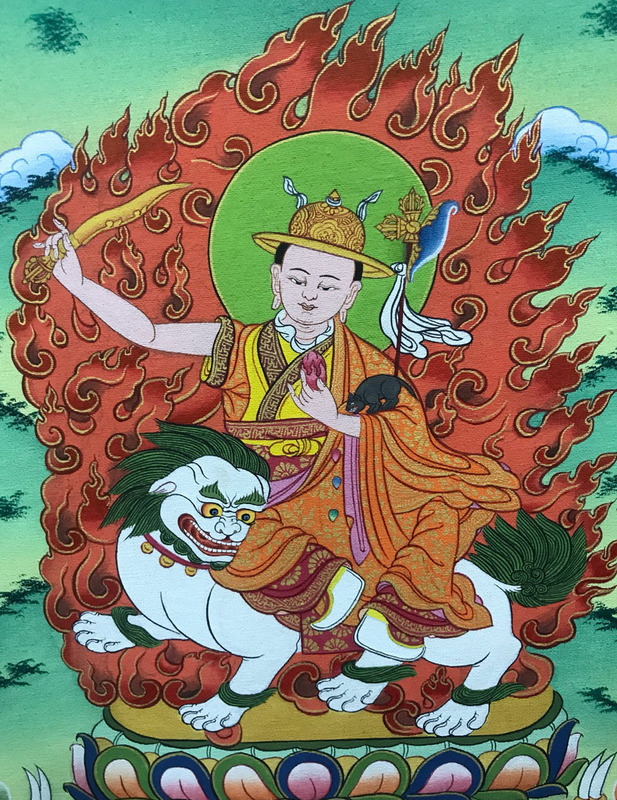 This beautifully illustrated graphic novel in the Nepali language explains the fascinating story of how Bhagawan Dorje Shugden arose as the supreme World Peace Protector of our time. When you understand his story and origins, you will gain even more appreciation for this powerful divine being. 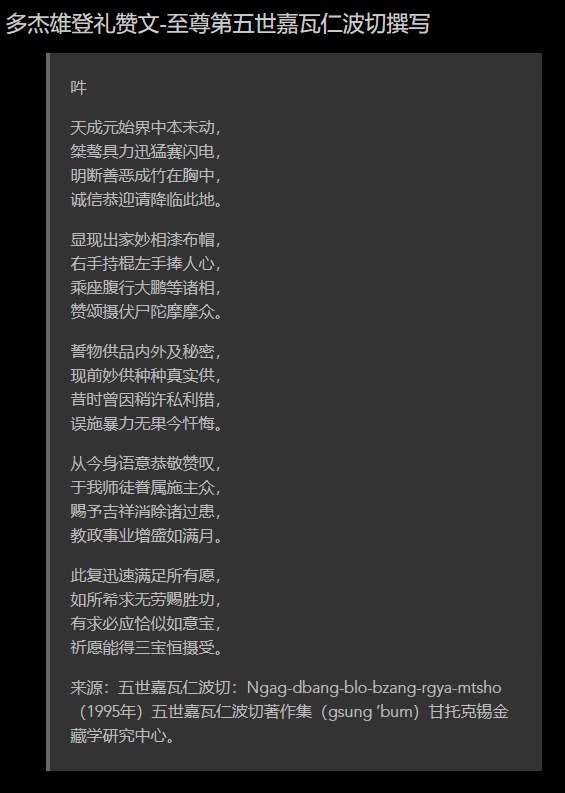 Thank you, Rinpoche, for sharing the mo ritual text composed by the enlightened Dorje Shugden himself during trance. 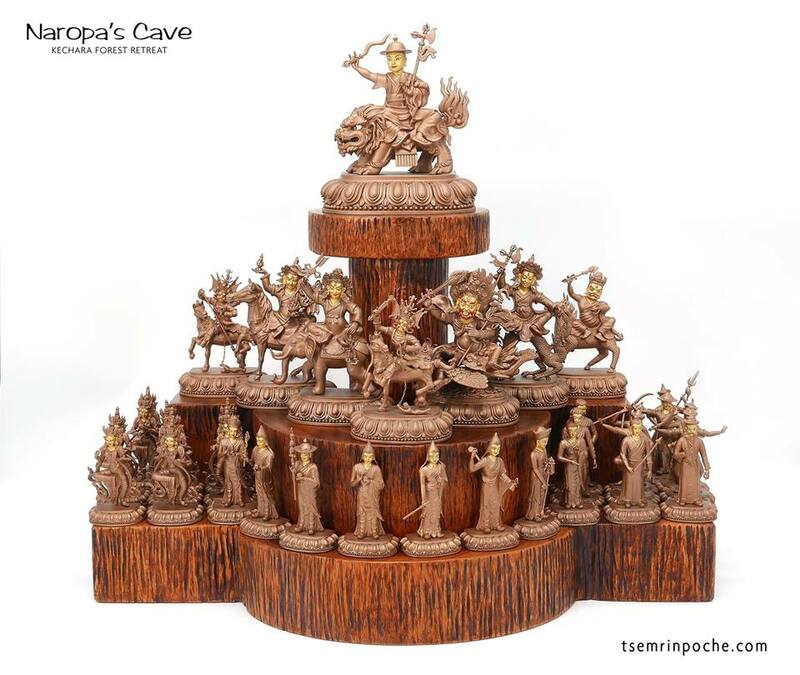 May many people benefit from mo of Gyalchen Dorje Shugden. Thank you Pastor David for sharing this article. It is indeed a very auspicious and meritorious trip. 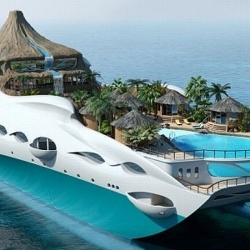 For people who like to travel, it’s not only because of shopping and relax. 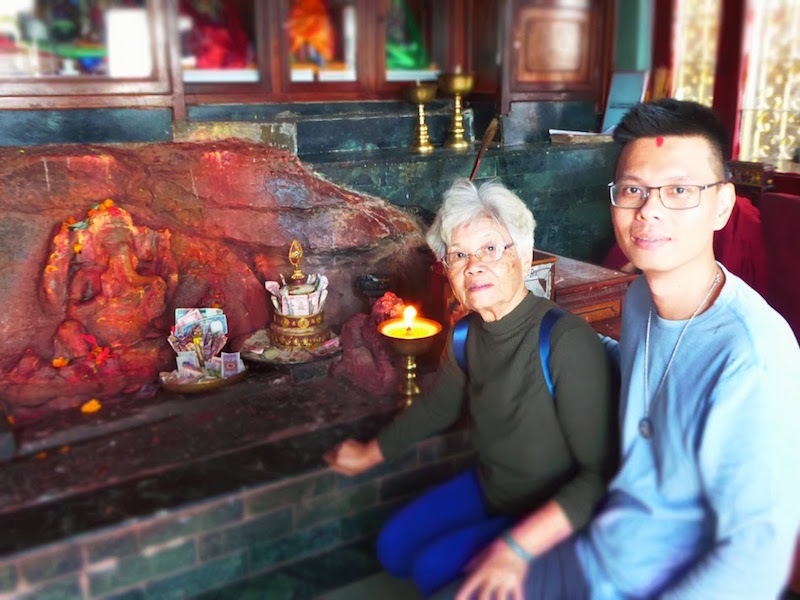 We travel to other countries to experience and learn about other countries’ culture, lifestyle, and for Nepal and India, we can learn about their religion. It’s really amazing to see so many holy sites, like the Tara that appear on the rock, Guru Rinpoche’s hand print, and so many Vajrayogini temples in Nepal. Instead of going other country for shopping and relax, Nepal is definitely a country that looking forward for next trip. Thank you Pastor David for sharing your experience during the India and Nepal pilgrimage trip. It is indeed very blessed to able to visit these holy sites. During my pilgrimage trip to Nepal last year, we were told to make big aspirations when we visit each holy site. Our aspiration should be towards enlightenment. There were tears rolling down my cheeks automatically when we visited Lumbini, the Buddha’s birth place. Maybe there were some past lives’ imprints that triggered my tears. Overall, it was a good experience to visit the holy sites and also to know more about the people and the culture of the Nepal people.
. This is the truth love they are concern their parents future life by bringing them to monastery make offering, visited holy side of Vajrayogini. 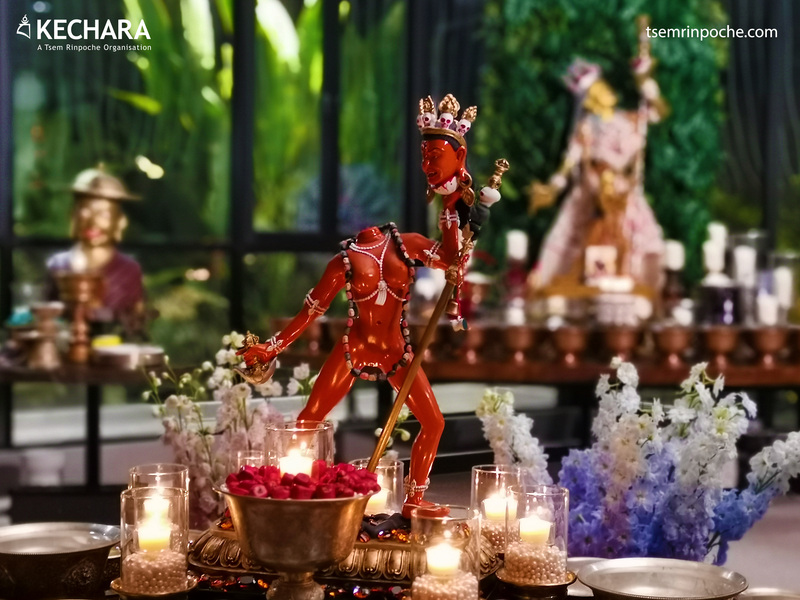 Making inspiration prayer to Vajrayogini along making butterlamp offering create close kamic connection will meet Vajraygini. 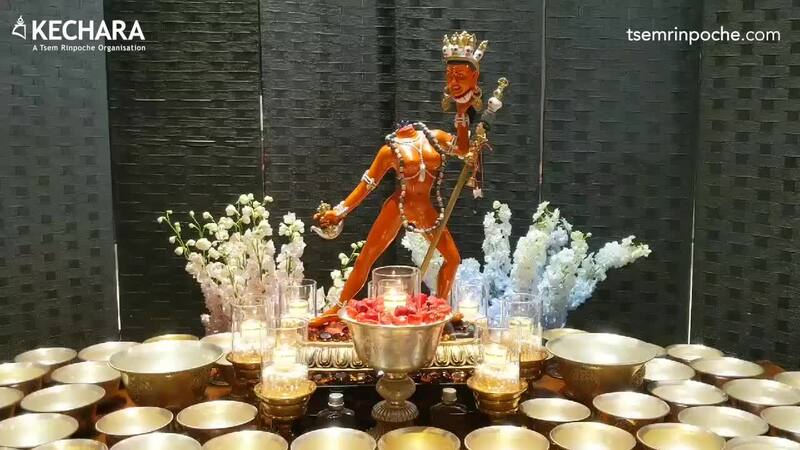 Pastor David even take his beloved mother earing offer to Vajrayogini statue, giving his mother has chance bless by Vajrayogini and connect with her. I truthly enjoy reading this article, if you ready love your parents, bring them to pilgrimage the holy side of holy saints enlightenment place, get blessing, will create karmic inprint in their mind to meet buddha and born near to dharma to do practice buddhism. Thank you Pastor David Lai for this informative article. 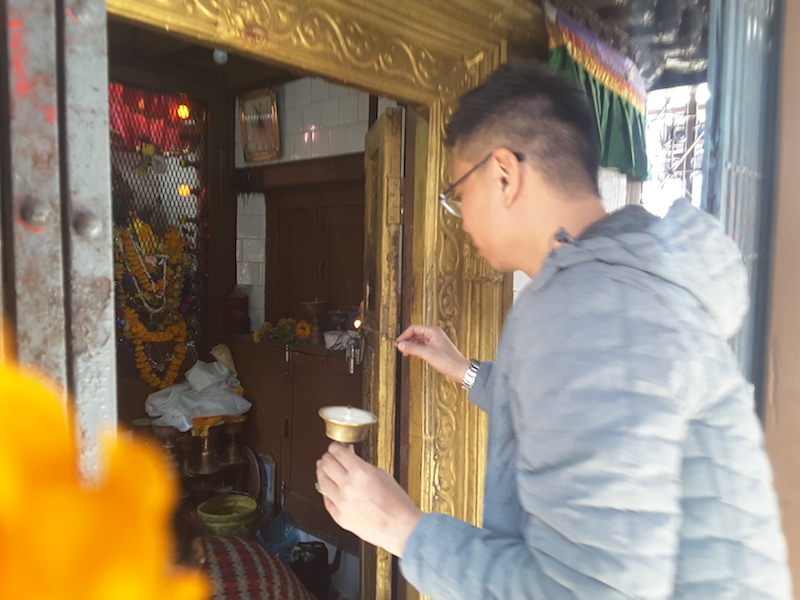 After reading, it began to reflect on me that instead of going for other holidays i should instead go on a pilgrimage which is more meaningful and beneficial as advised by Rinpoche. One day I hope to go on a pilgrimage and i hope that day is not too long as age is no longer on my side. It is great that Pastor David, Uncle Lao, Paul and mother travelled to these places fill will positive energies. For many people, especially for those who ‘ve yet to tap into any religion, we will choose to travel to some places to search for short term happiness such as eating good food, shopping and more. However, it will not benefit us in any way and they will only make our minds weaker. 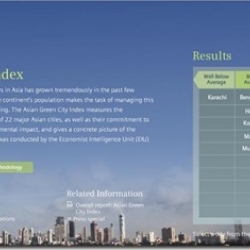 I ‘ll choose to travel to places like Nepal or India to strengthen my mind and do more meaningful activities. Thank You Rinpoche and PDL shared more about Why we need Pilgrimage and the benefits of Pilgrimage on this article, in the uear of 2912 & 2013 i very fortunate to follow PHO going to Nepal for KP shopping trip ( and PHO did brought me to all the holy pilgrimage sites in Nepal, except Lumbini ). 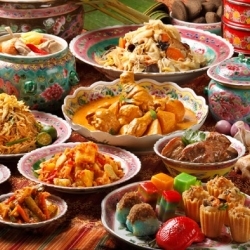 I do appreciate PHO gave me a chances to follow him, Thank You so much Kechara & PHO..!! It is wonderful seeing people, especially elderly, makes extra effort in exploring and experiencing in an adventurous religious tour. It’s even marvellous to have loved one to share an exciting time together developing memories. I’m truly happy for pastor David and Paul’s family. Thank you for leading the discussion, pastor Henry. Thank you Pastor David for such detail explanation about the places in Nepal and it’s significant. 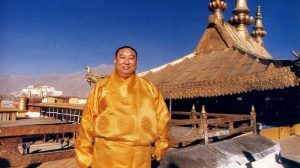 Yes, I really agree with what you wrote about Rinpoche suggesting you spend a meaningful holiday by going to a pilgrimage trip, because it is the same holiday, so why spend it on a meaningless shopping trip whereas we can go visit temples and make offering to collect merits and the imprints. Nepal is one of the nicest place that I have visited, I went during the season just before winter, the weather is nice and we managed to visit quite a number of holy sites, although that was a purchasing trip for Kechara Paradise outlet, but when we visit places like this, we should take some time off to visit holy places and make a good aspiration. I enjoy reading this article, it brought back so much memories of my visit in many years ago.. Hope 1 day I can go visit again. Thank you Pastor David. 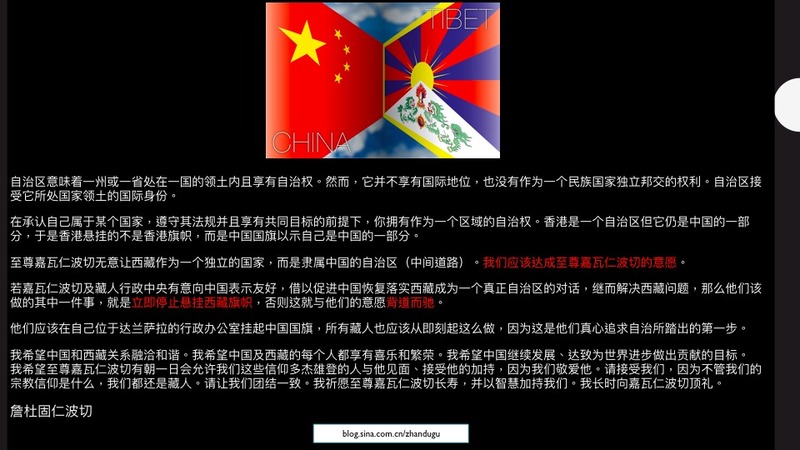 Your article brings lots of benefit to us as a Buddhist who plan to visit the places. We learn so much for why we need to visit these places and how to collect more merits during pilgrimage. In short, the information provided in this article will make the pilgrimage trip easy, relax, meaningful, spiritual and collect more merits. Our tonight discussion, Pastor Henry also provided lots of information and along with this he also shared Dharma to make the discussion more benefits to us who did not have chance to visit the places. Must create cause to visit all these places while still alive. Thank you for sharing your pilgrimage through Nepal and India. It is indeed a great opportunity to make such a pilgrimage with the correct motivation. Because of your explanations many will understand much more and earn more merits during their pilgrimage, because they know the meaning and preciousness of these holy sites. We are very fortunate to have met the dharma and to have a precious human rebirth. We need to create the causes to be close to our Guru and the Buddha again in our future lives. Thank you Pastor David for your sharing. 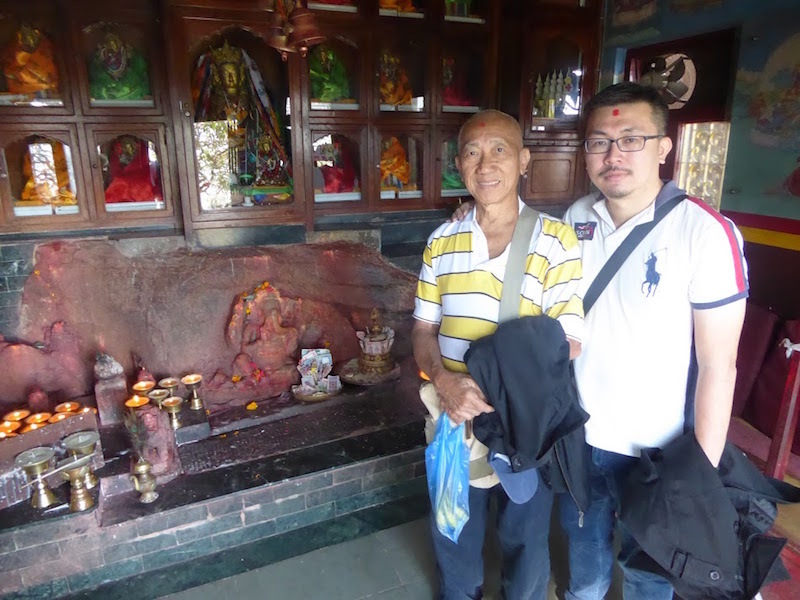 My first trip to Nepal was with you and Su Ming together with some other Kecharian. You have a great knowledge for the places we visited and it’s very fruitful and meaningful. Visiting sacred and holy places is great but with understanding and able to make prayers will make the visit more meaningful and meritorious. It’s wonderful to see how Paul and you benefits your parents through this pilgrimage by making great offering and prayers for them and their future lives. It’s the best gift!. Nepal indeed is a holy land for Buddhist pilgrims to visit and make offerings and aspirational prayers. Just in Kathmandu and nearby the city already has so many holy temples. 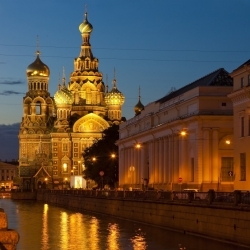 I am fortunate to have visited these places mentioned here a few times. Another very holy place one should visit is Lumbini (west of Kathmandu), the birthplace of Lord Buddha. Pokhara (north west of Kathmandu or central Nepal) is a beautiful scenic country side with lakes. And the ‘must’ destination for avid trekkers and mountain climbers is the famed Mount Everest. 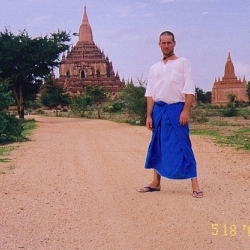 I was very fortunate to have the chance to visit Nepal and India years back before we had Kechara Forest Retreat. During my time in Kechara Paradise (KP), Pastor Henry brought a group of us for a ‘shopping’ trip. The beautiful statues and items back then, were personally handpicked by some of us to be put in KP for the public to invite home for their spiritual path. We visited the places that were mentioned by Pastor David above. We were really blessed and fortunate to visit such holy places, make offerings and aspirational prayers to generate merits. 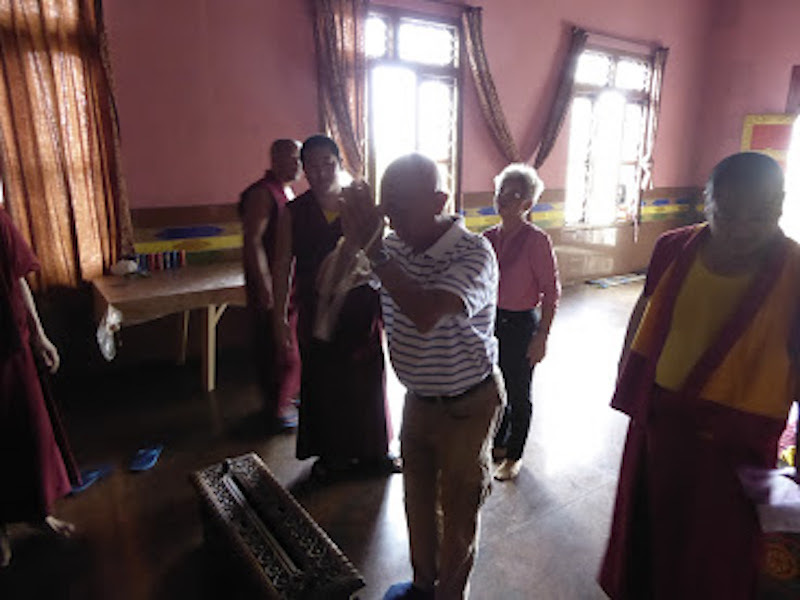 While in India, I had the privilege to visit Gaden and also make offerings to the holy Sangha. When we were there, there were many ongoing pujas, debates and teachings. It was really exciting to see so many activities in the monastery. We also had the chance to circumambulate stupas of previous high Lamas. Instead of spending our vacations on something that does not bring benefit, why not spend it on pilgrimages and generating merits. 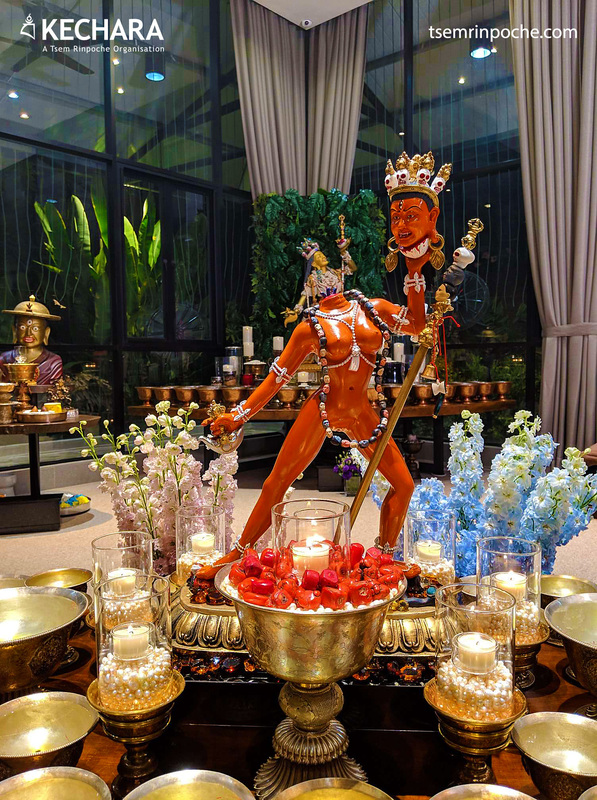 Visit Kechara Forest Retreat and receive the same blessings as KFR is also fully blessed by our Guru, Dorje Shugden (in trance and fire Puja), high Lamas and the sangha. Thank you Pastor David for sharing your visits to Nepal and India. I really like the idea of Rinpoche had suggested to you for pilgrimage to these beautiful sacred places and monasteries with your dad. 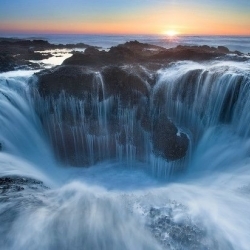 The sceneries are beautiful and I hope that one day I will have a chance for a visit. Finally, logic prevails. 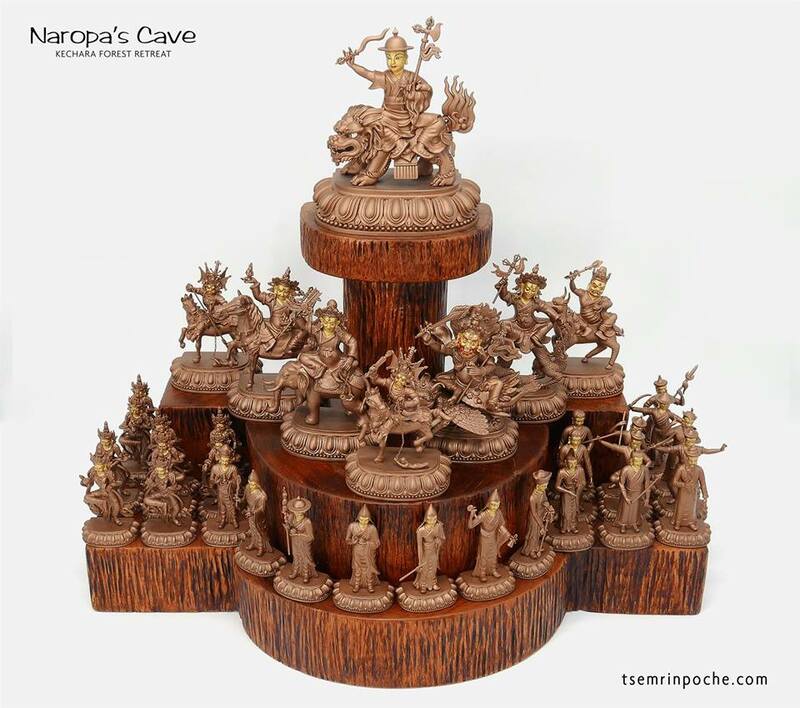 People who can think beyond gross prejudice are beginning to see the goodness of Dorje Shugden. 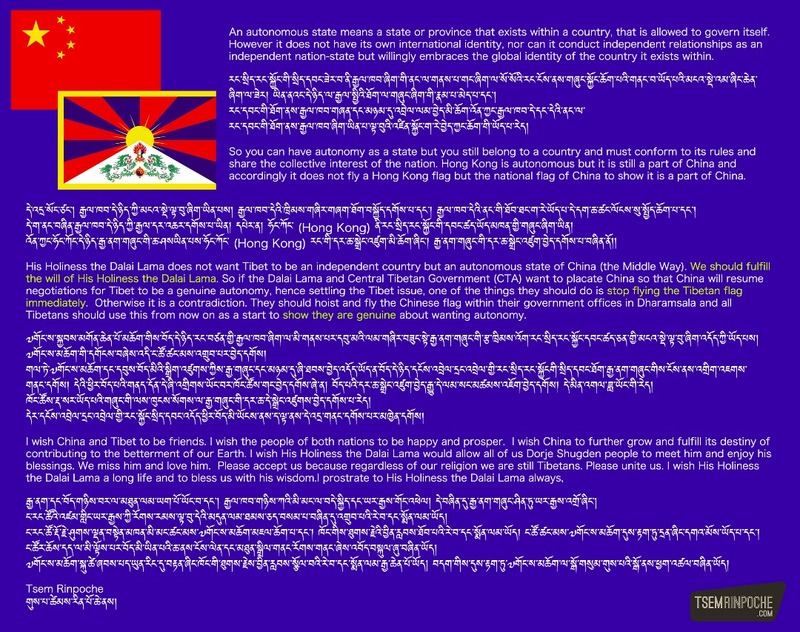 I came across this comment by Suzy on Rinpoche’s YouTube chanel (https://www.youtube.com/watch?v=Vl-4lIwxph4&t=11s) and it is such a welcome change from the usual abuse hurled at Shugden people by those do not understand the issue. 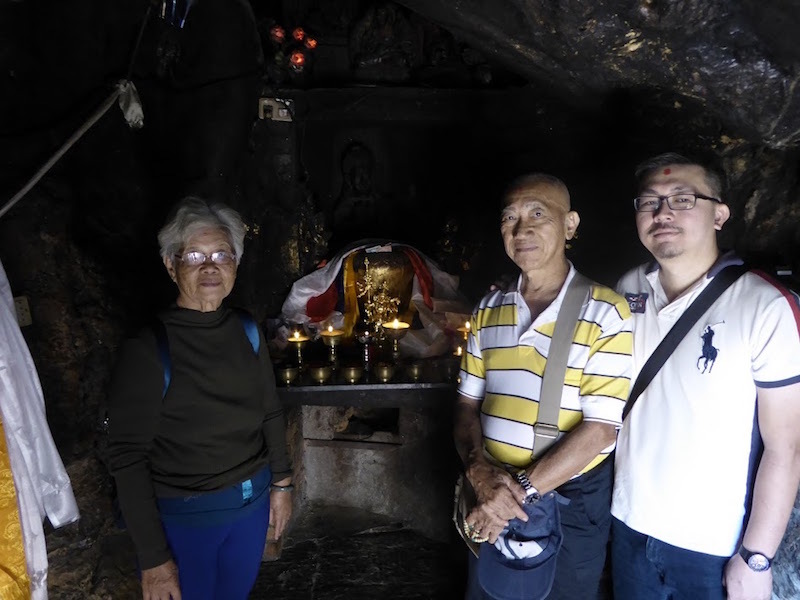 Rejoice to Pastor David, Uncle Lai, Paul and Paul’s mother as they have opportunity to have join pilgrimage trip together and made offerings in abundance to many Sangha at Serpom Monastery as well as other temples. This is very blessed and great to collect merit. Thank you Pastor David sharing this meaningful pilgrimage trip in details which is very useful as a future guide to those may interested to visit the same holy places. Beautiful and meaning pilgrimage journey through India and Nepal. Thank you Pastor David for sharing your pilgrimage.Travelling with your beloved dad ,Paul and his mother, was really wonderful.Rejoice. Travelling and visiting to those beautiful Holy monasteries was amazing and powerful. It will enaable one to connect with the aspirations and energies of that place.,in order to plant powerful blessings into our mind stream. Well i do hope one day i could go on a pilgrimage too to those Holy places in India and Nepal. Thank you Pastor David….a good teaching on pilgrimage and beautiful pictures shared . Thank you Pastor David for such a good travel log. It has indeed brought back many good memories I had when I travelled to these places both in Nepal and Serpom. I have been to Serpom and Nepal on two separate occasions but you did it in one trip! 🙂 Travelling to monastery like Serpom really open my eyes and had a glimpse of the life of monastery. 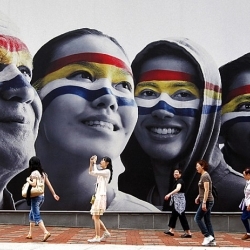 Thank You Pastor David Lai for sharing the beautiful article with all the beautiful pictures. I particularly like the Vayrayogini statues in the ancient temples. I wish I could bring my mother for the pilgrimage of these holy sites especially related to Vajrayogini next year. I will be praying for it daily. Thank you Pastor David for sharing your pilgrimage trip to India and Nepal with your dad and Paul and his mom. This certainly brought back all the fond memories after seeing all those beautiful holy photos posted on the blog together with the wonderful write up too. As for Paul’s mom, she was so thoughtful to have a protector puja done for her late husband in the monastry. Rejoice for all of them and may they all have good health and long lives. Thank you Pastor David for sharing about your recent pilgrimage to India and Nepal together with your beloved father as well as Paul and his mother. 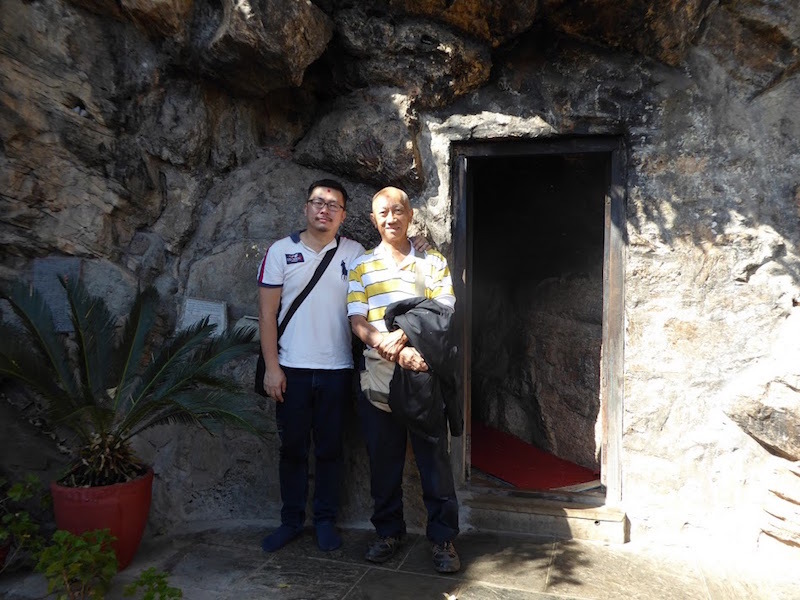 Looking through all the photos of all holy and blessed places you visited with your dad is a great reminder of the time where I was lucky enough to visit all the temples, shrines, and monasteries in the article above. 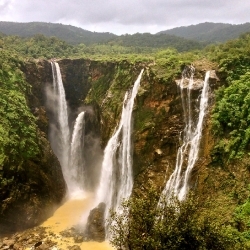 Thank you for taking the time to write well detailed information of all the places you visited during your trip, may more people who are planning to go on a pilgrimage benefit from this post. Thank you Pastor David for the itinerary and sharing on the holy places. Those holy pictures sure a feast for everyone. I was in Nepal few years back but doesn’t has much picture as most of the mini temple doesn’t allow photography. 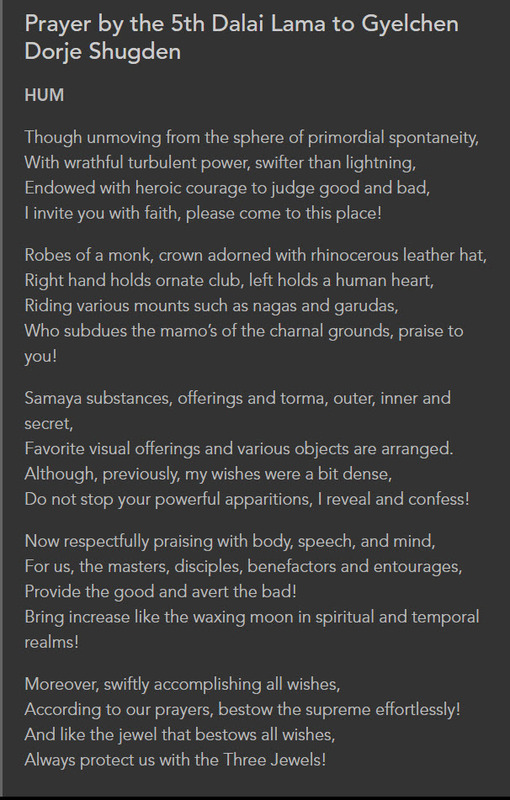 I think every practitioner should make an effort to visit these powerful places & pay homage to the Buddha & Bodhisattvas to make spiritual connection with them. Through this, we receive blessing & create the cause to be near a guru, receive the dharma & practice the dharma to bring peace & joy to ourselves & others. Thank you Pastor David for sharing your spiritual journey with great details. Appreciate very much your clear explanation & guidance on what & how we should be praying for while in these powerful places. 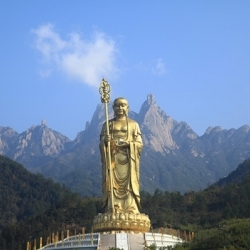 These are definitely the places we should visit & pay homage to the Buddha & great Bodhisattvas. Thank you Pastor David for sharing your pilgrimage with your dad, along with Paul and his mother. 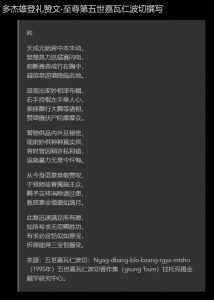 It’s very touching to read that you and your dad requested the monks to do a puja for your late mother and also offerings made to Vajrayogini for her. The best gift to our parents and loved ones is to bring them closer to the Buddhadharma. This is because we help them create the affinity and karma to have a chance towards realizing Enlightenment. What else is greater Enlightenment? Our parents and loved ones may not understand the significance but what matters is that we know that seeds of enlightenment have been planted in their mind stream. It will help them in their future lives. I believe this is what unconditional love really means. Travelling around the world can help us to widen our perspective, open up our mind. 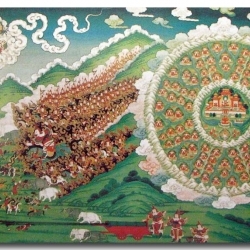 When we understand more Dharma, the purpose of travelling changes. When we travel, it’s not just purely for pleasure but with purposes that is beneficial for ourselves or people who are close to us, in a dharmic way. 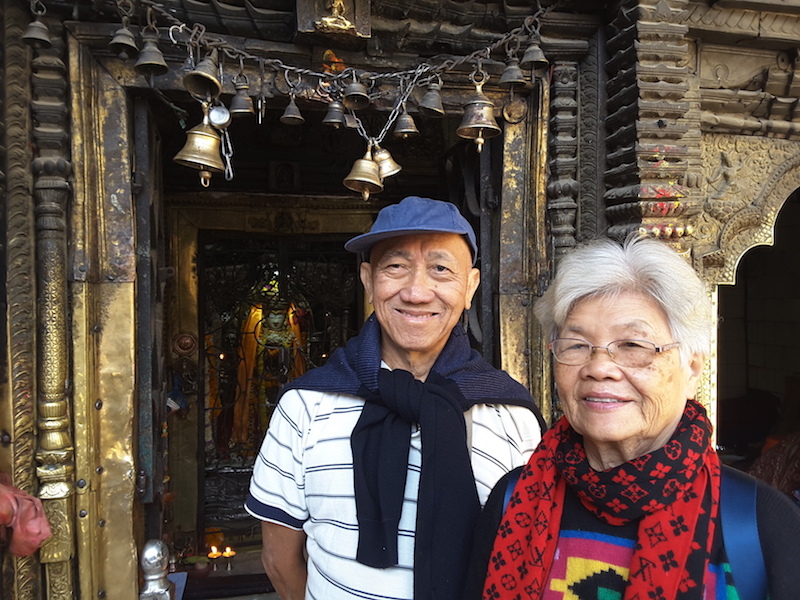 I rejoice for both families that had the opportunities to visit so many holy sites in Nepal and India, with the great blessings of Tsem Rinpoche. 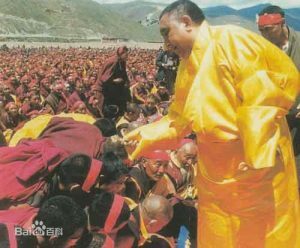 Rinpoche always tirelessly shower love and care to His students through different means, with the sole purpose of benefiting them. Thank you Pastor David for writing and sharing the travelogue with pictures of the pilgrimage in Nepal and India. 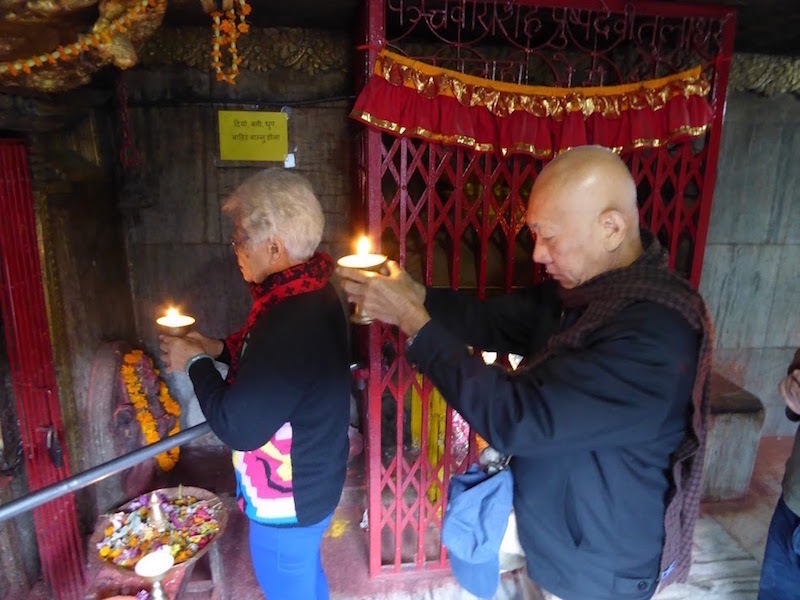 Nepal itself is rich with ancient Buddhist temples with many previous high masters left their enlightened energies at the sacred sites for us to receiving blessings and gain merits whenever we make prayers, offer lights, butter lamps, flowers and other types of offering. 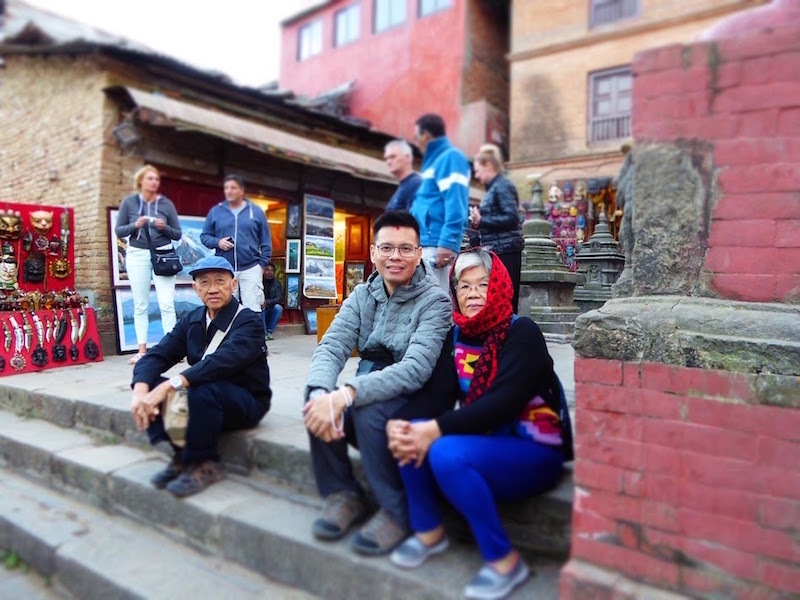 This travelogue is very a useful guideline for those who have not been to Nepal and through the pictures of Buddha Vajra Yogini, Mother Tara, Buddhist temples and stupas, these pictures can plant seeds in our minds and create the cause for us to be there. 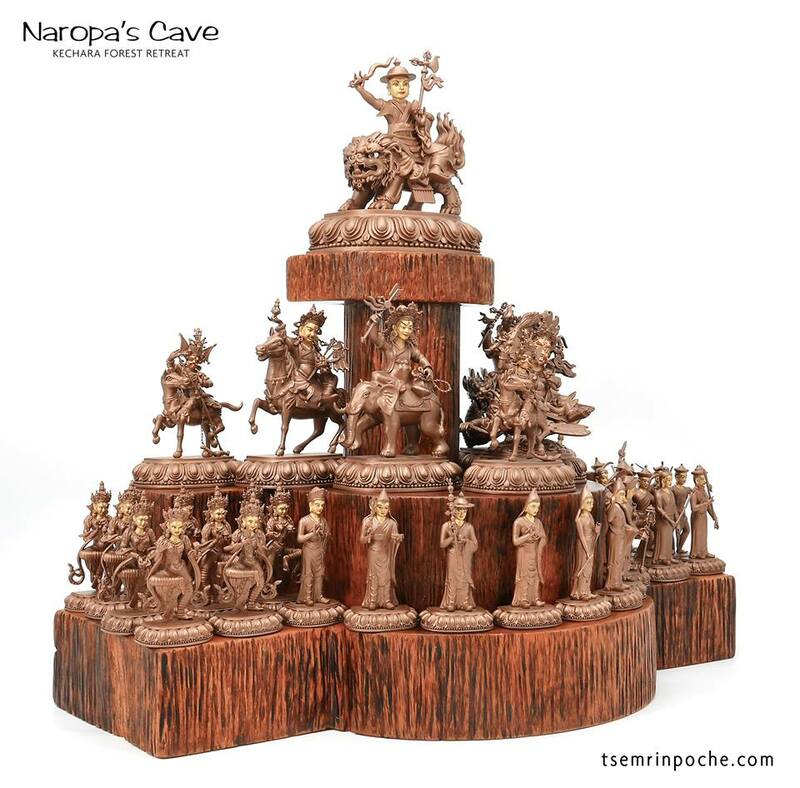 With the blessings from Rinpoche, we should grab the opportunities to participate and join the pilgrimage trip to Nepal whenever it is organized by our own Kechara team so that we can accumulate merits to sustain and expand our Dharma works, and at the same time encourage others to join the pilgrimage. Dharma does not come to us by chance but through our efforts and good motivation to learn and practice the Dharma supported by the merits we accumulate by doing Dharma works, reciting prayers and mantras, making offerings to the 3 Jewels and participating in the pilgrimage. Thanks for sharing this with us Pastor David. Besides providing info on various places, most importantly Pastor has given us some tips on what we have or should have done when we are going to visit those sacred places. The aspirations prayers are very important to seal the deal. Thanks Pastor and very happy for the four of you. Thank you for sharing this article and images Pastor David. It must of been wonderful to visit these holy places make prayers, offerings and recitation of mantras at these sites charged with enlightened energies. It must of been a very meritorious trip! I rejoice for you and everyone who went. Thank you, Pastor David for the clear explanations for each holy sites visited. Such a precious guide for the next pilgrimage to these sites. 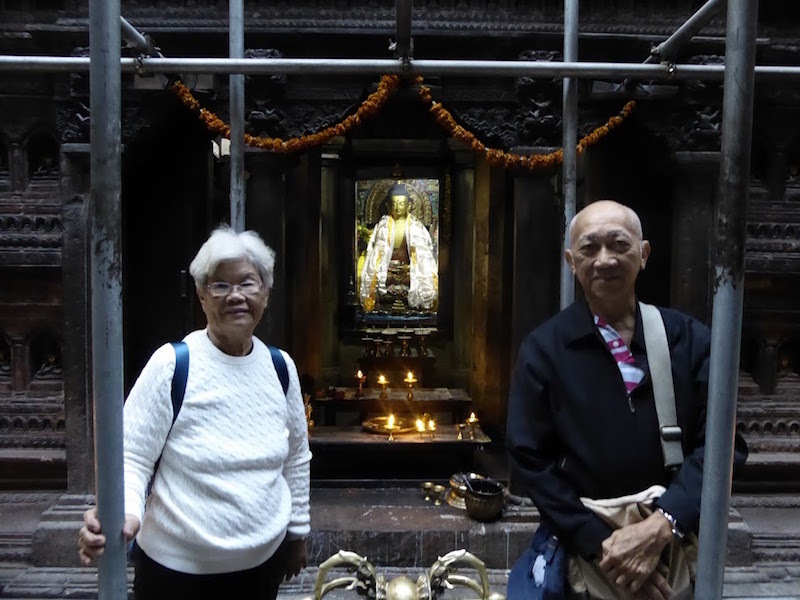 Both your father and Paul’s mother are very blessed to have Rinpoche to guide them and both you and Paul to assist and make this trip happen. May they have stable health and long to continue their dharma work. 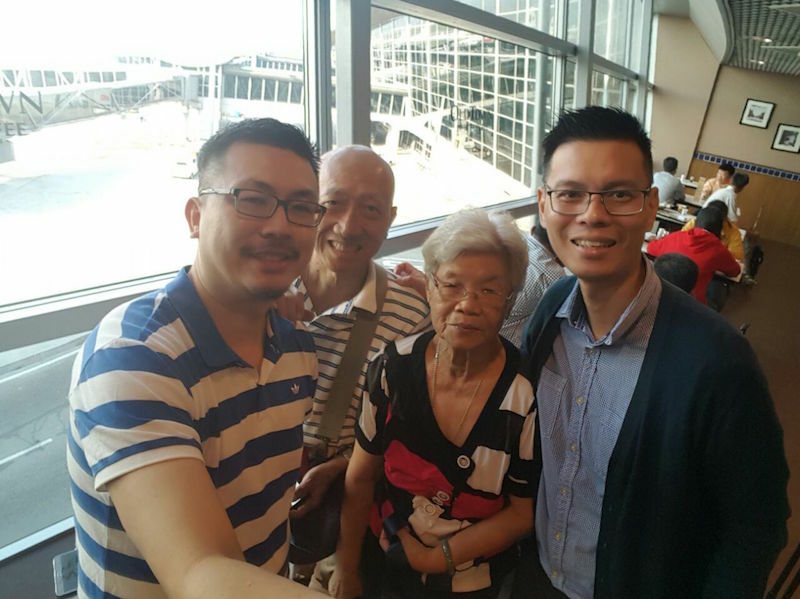 What a beautiful spiritual holiday trip for Pastor David, Uncle Lai, Paul and his lovely mother. If you could bring your parents on a holiday, why not bring them to a spiritual one that actually blesses them and plant seeds of enlightenment for them. What a meritorious holiday this certainly was and I rejoice in their wonderful blessed trip. And beautiful pictures too! Thanks Pastor David Lai for your explanation on the significance of each holy spot. 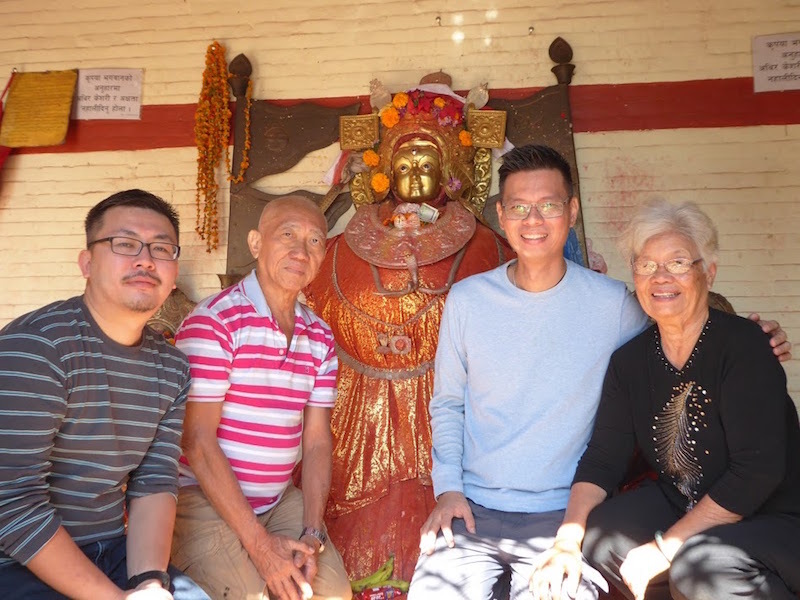 It is amazing how you are able to retained all the stories and information Rinpoche has shared throughout the years with you and hence, now able to share it with others. They give the place a lot more meaning and appreciation when we visit it. 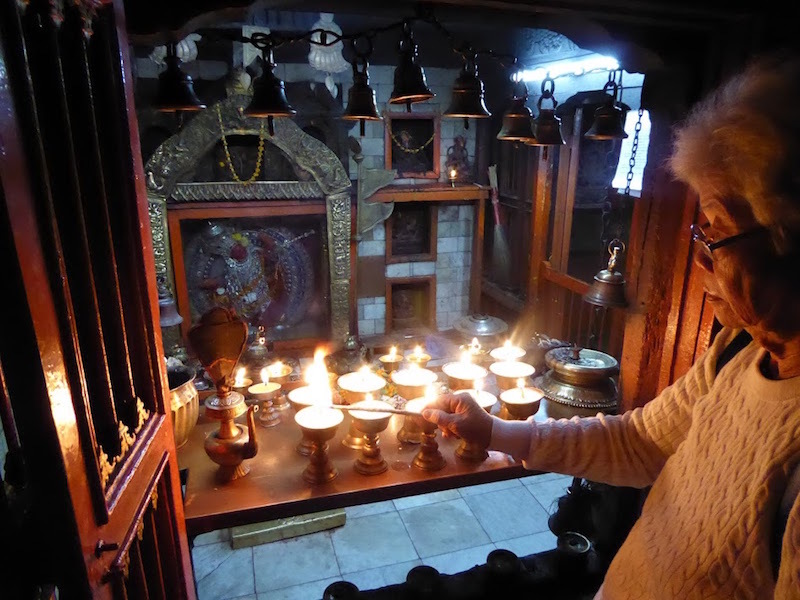 Going to Nepal is really like stepping into a different realm of spiritual sacredness. I wouldn’t mind living there in a retreat, it is such a holy place, filled with sacred mystical energies. One must go to there to experience it, especially if you are a Buddhist and visit all these powerful holy places! Once again thank you Pastor David for lovely post. Oh and I especially liked the story you relayed on seeing a female temple caretaker who looked a little crazy, who could actually be dakinis. How mysterious and magical, something we would not know if Rinpoche did not tell us. How blessed you are to have such an encounter and to remember Rinpoche’s advice! Uncle Lai looks extremely vibrant and happy too. This is a really good trip for him and Paul’s mother also I am sure. Thank you Pastor David Lai for sharing, it is like being there all over again. The energy is much, the sights spiritual and soothing, the sounds hushed and ethereal, the scents penetrating and lingering. Nobody should miss a trip to Nepal to visit these power places. 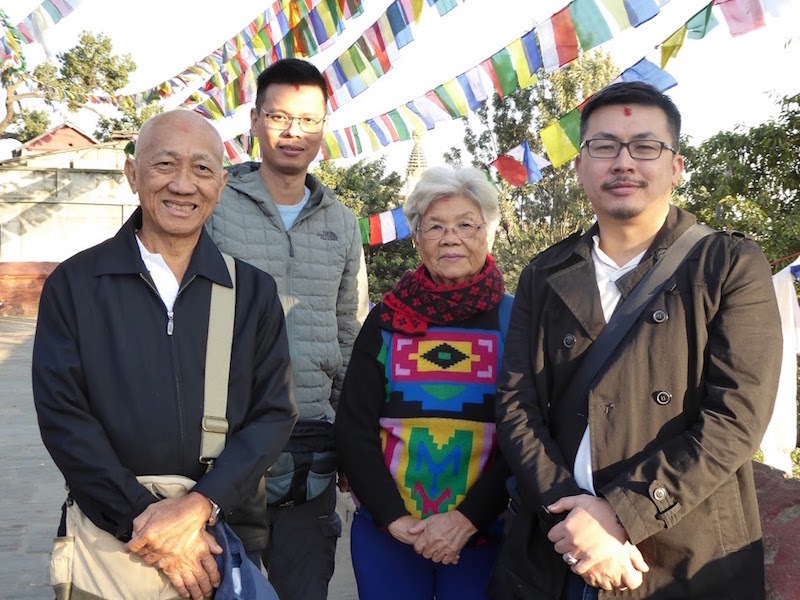 Im very glad that we have the great opportunity of going pilgrimage trip together with our parents to holy sites in Nepal, and making offerings to many holy Sangha at Serpom Monastery. This indeed a wonderful experience for all of us. 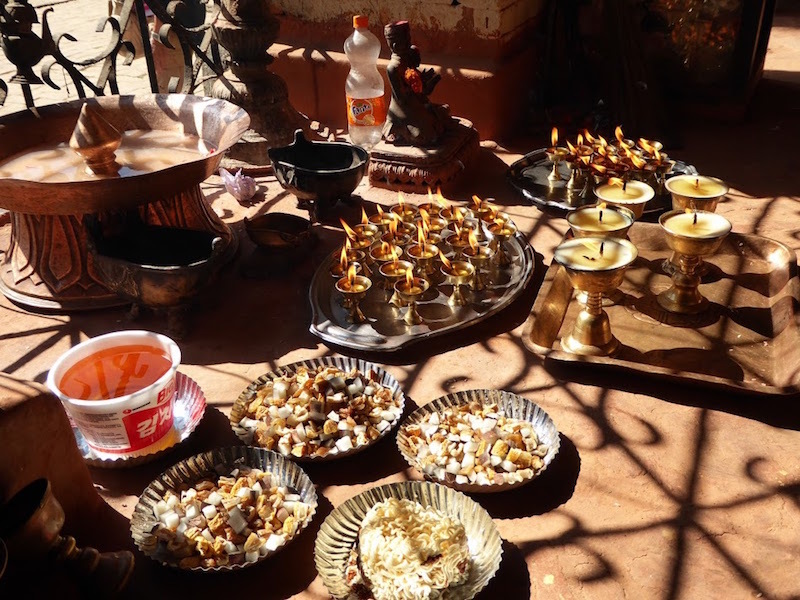 Im very thankful that my mum has chosen Serpom monastery in conducting a puja for my late father, instead of following the traditional method of burning incense paper incessantly. 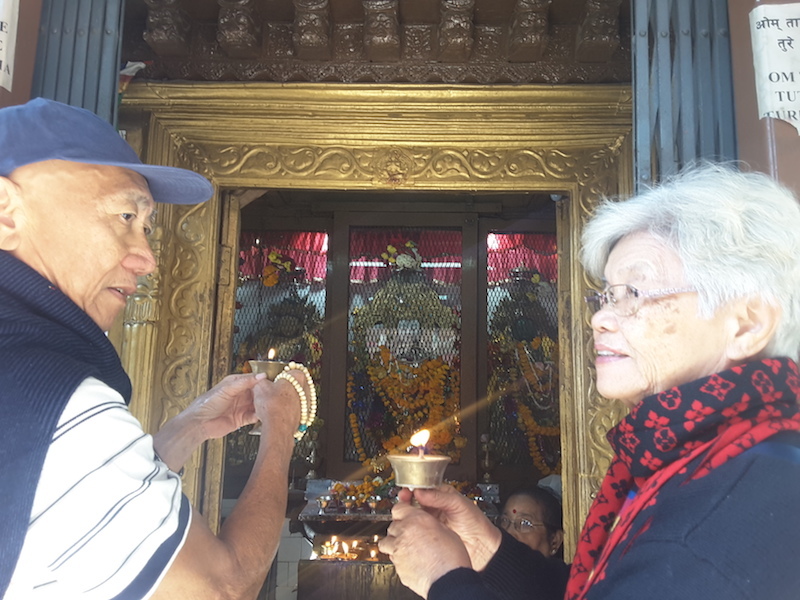 I can tell that my mum was very happy during her visit in Serpom and especially during the time of puja. Lastly, i would like to thank the kindness of H.E. 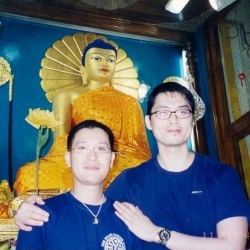 Tsem Rinpoche for making this trip possible for all of us, thank you for all the encouragement and advised for my mum. She is much older now, and i think this is one of the good way to repay her kindness and hardship for raising up all her kids. 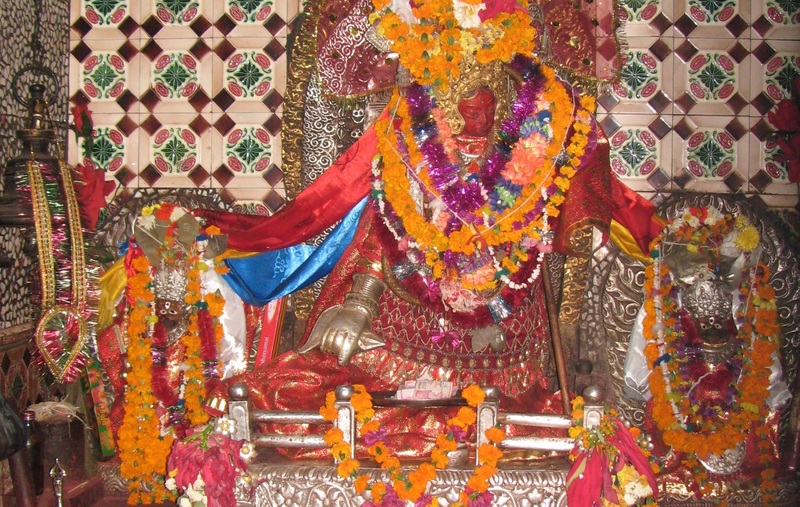 Great pictures of nepali Vajrayogini holy places.